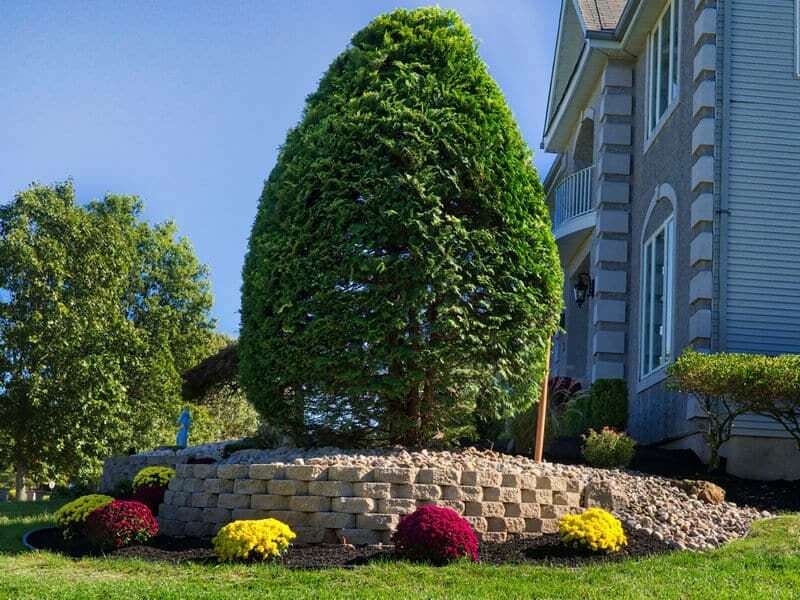 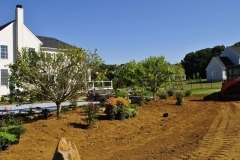 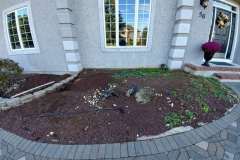 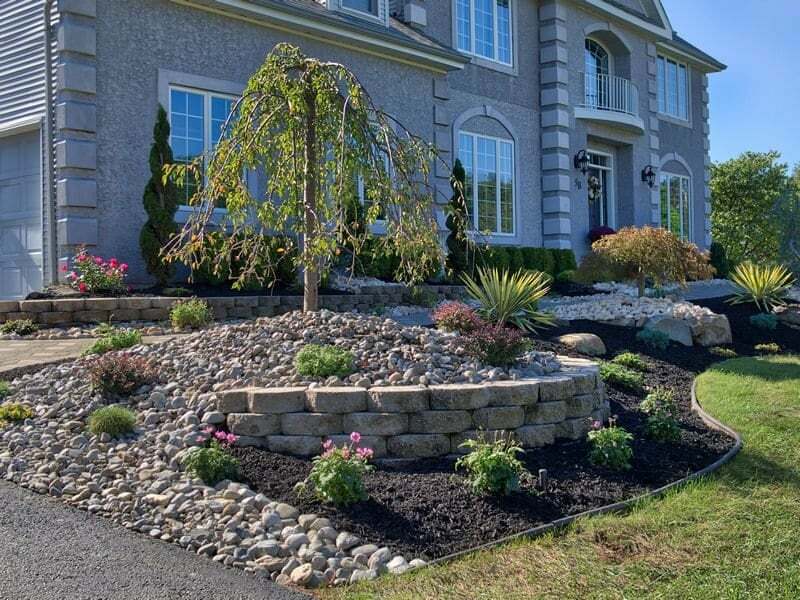 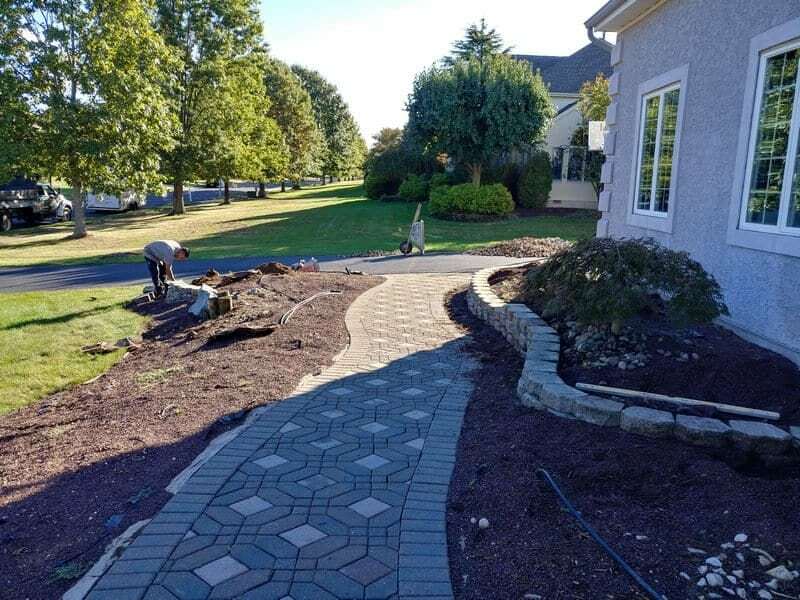 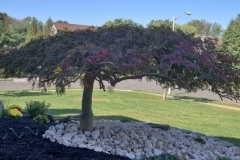 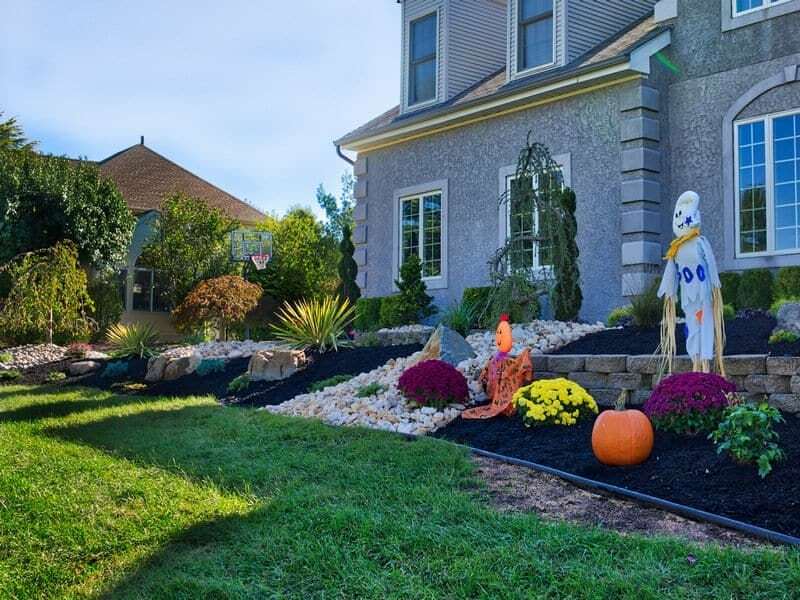 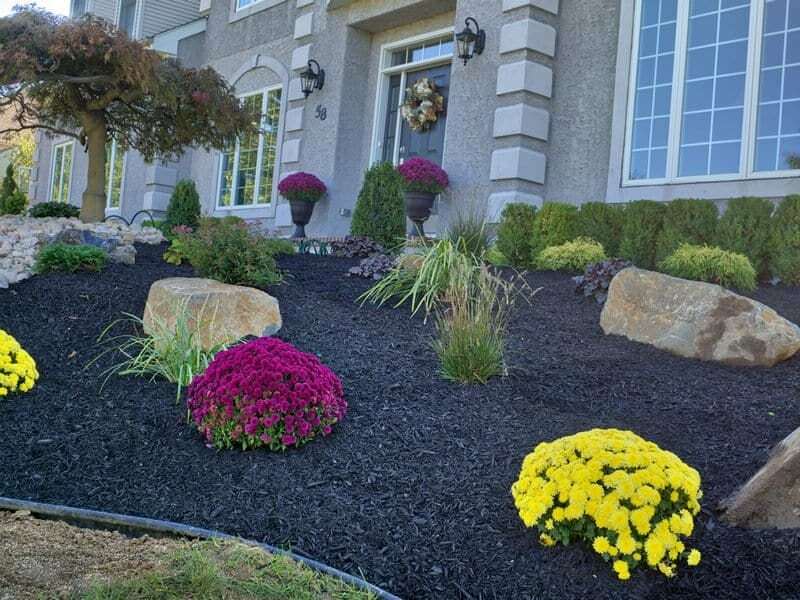 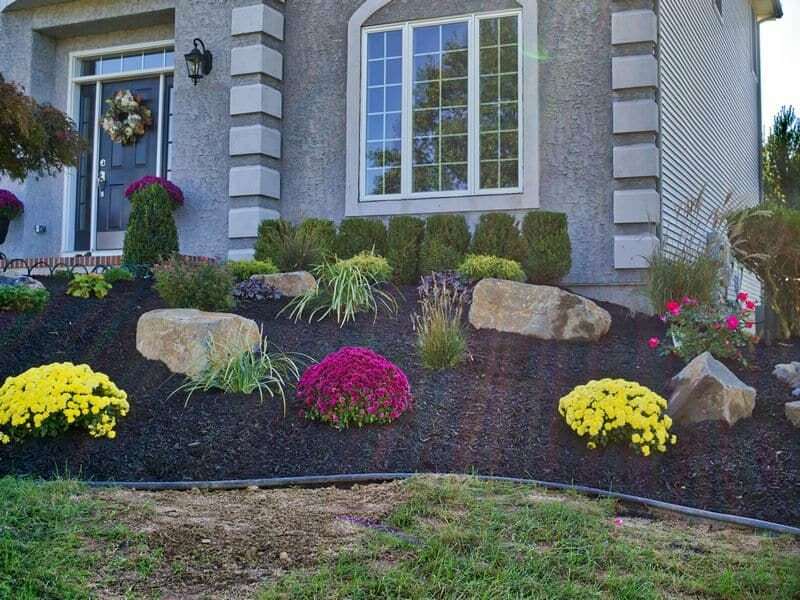 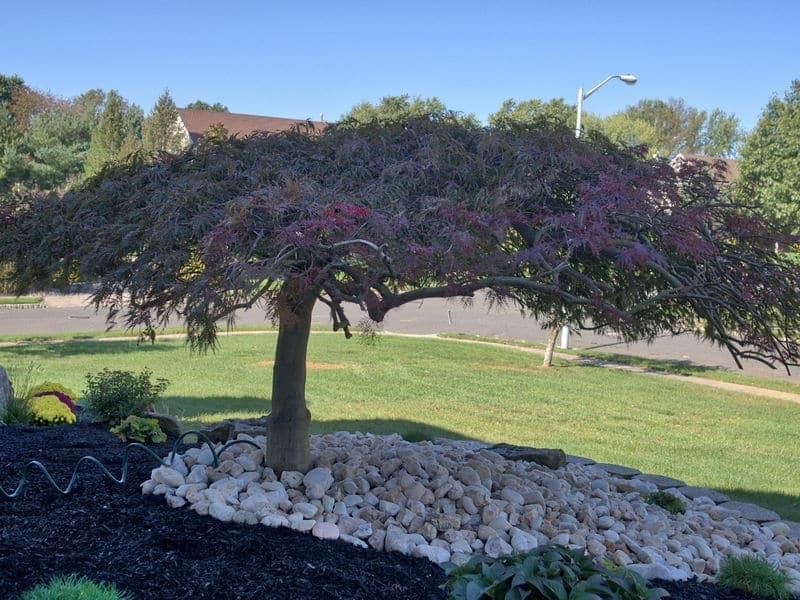 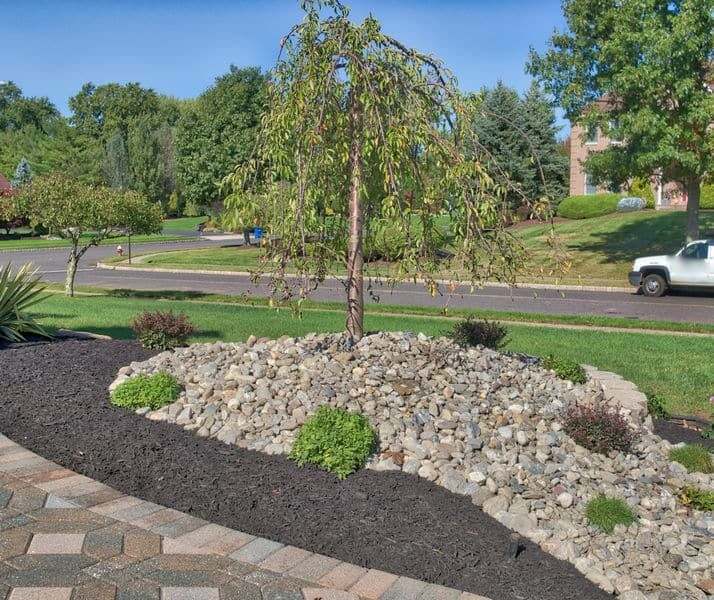 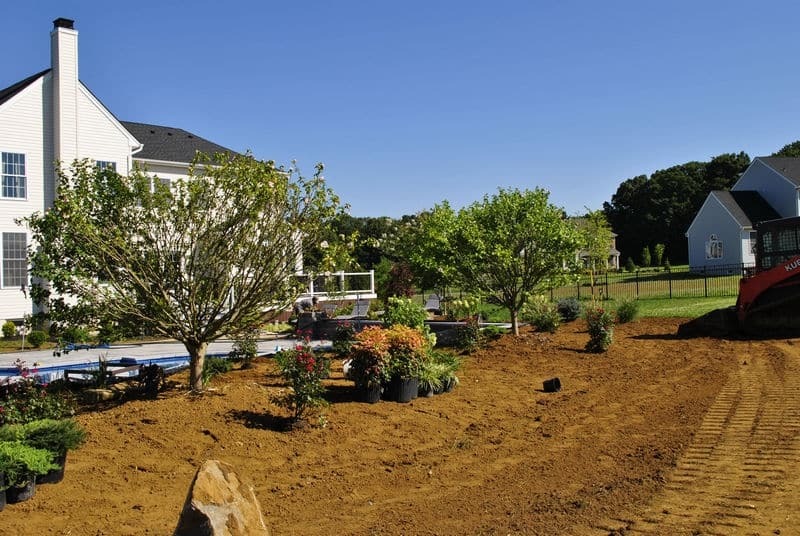 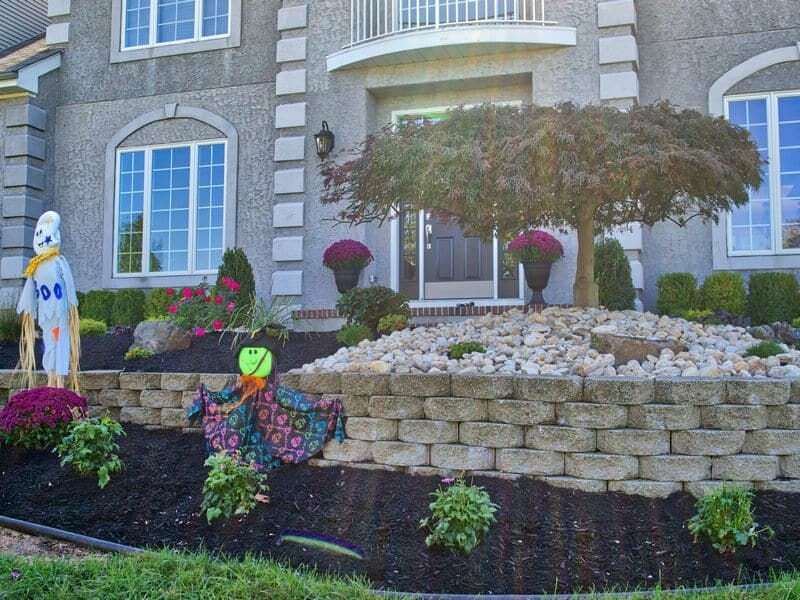 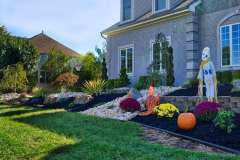 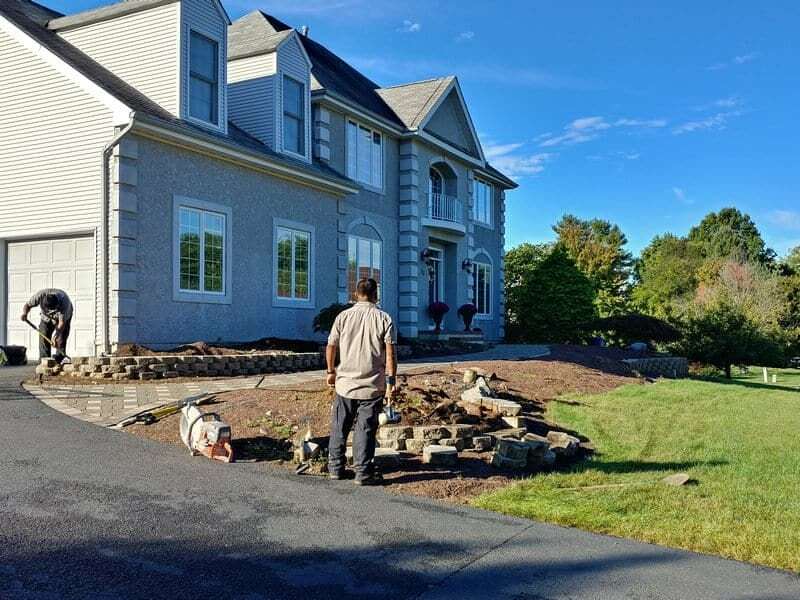 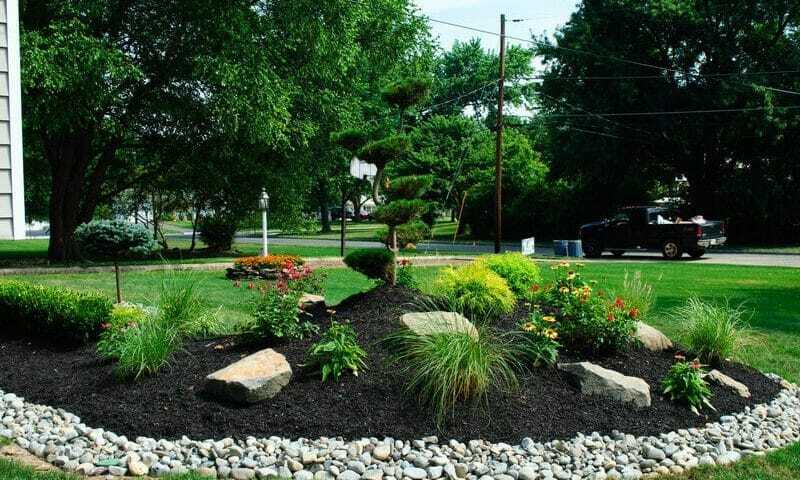 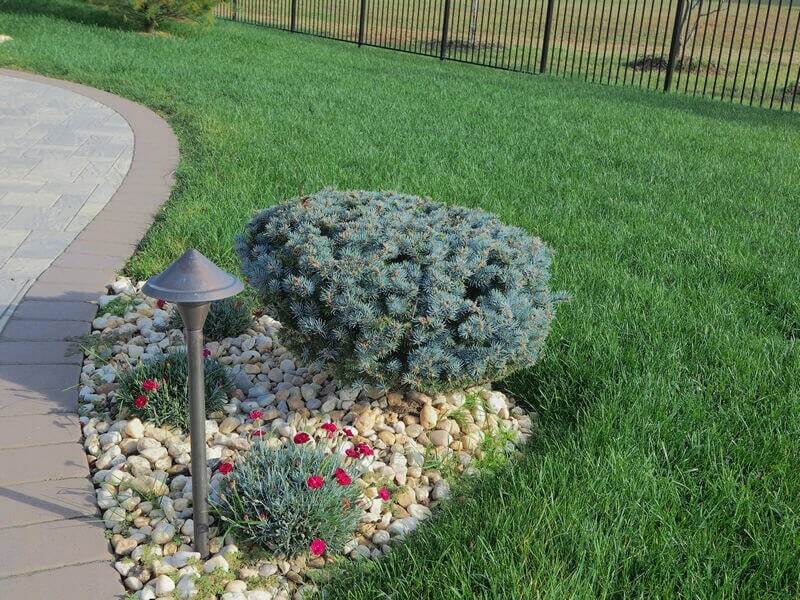 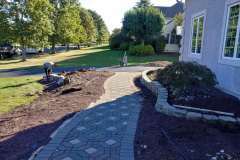 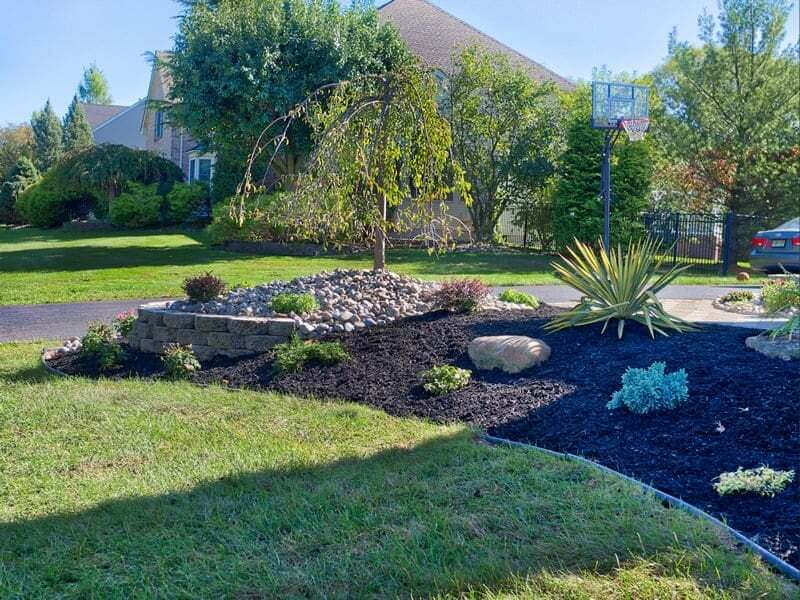 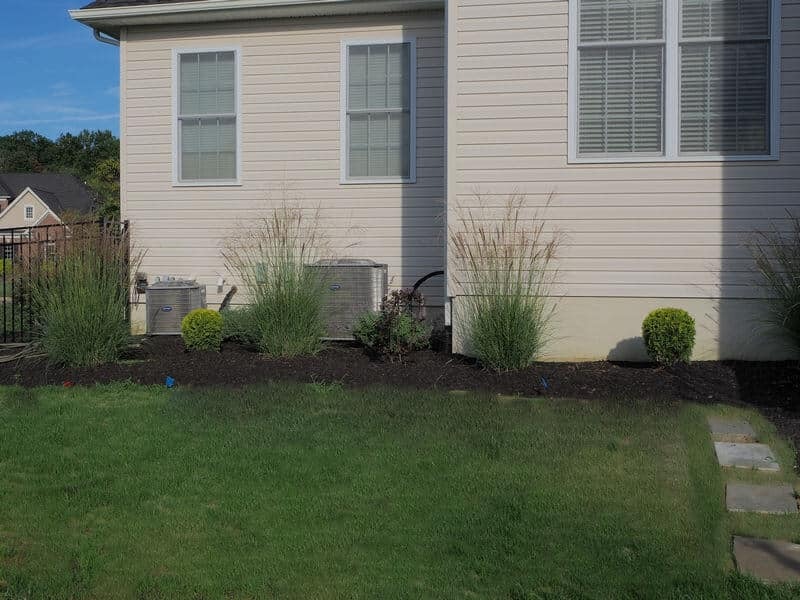 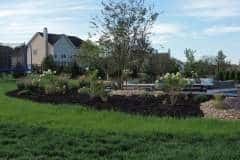 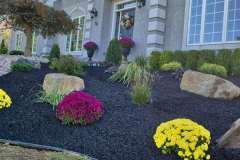 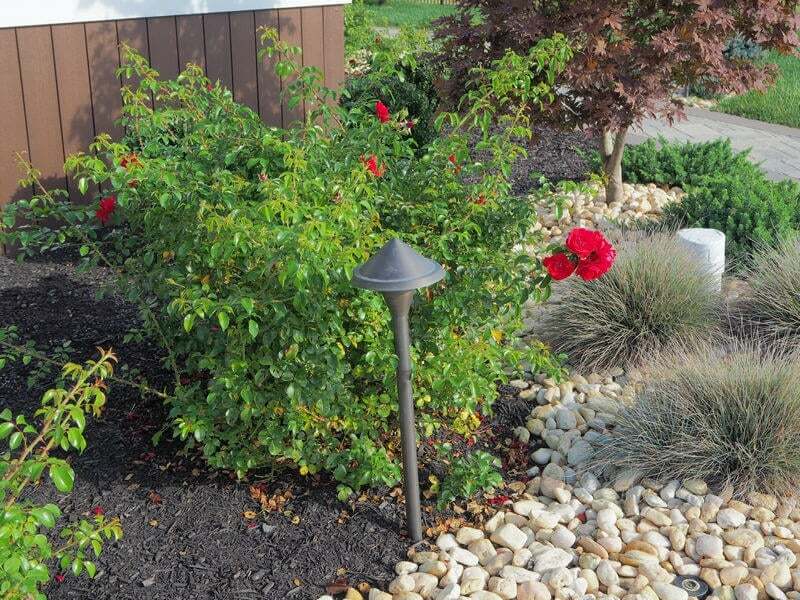 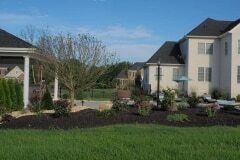 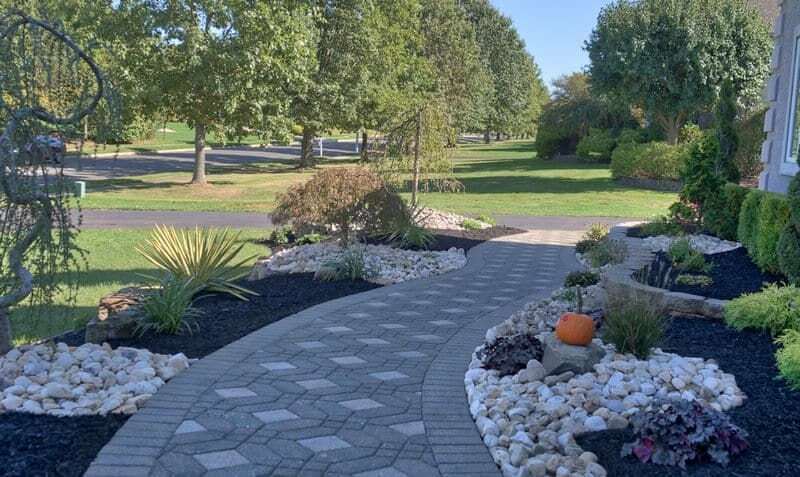 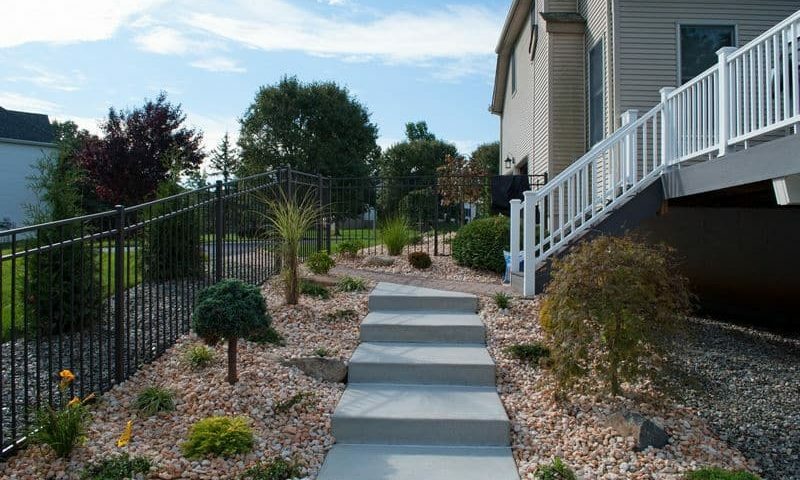 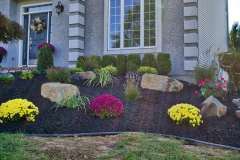 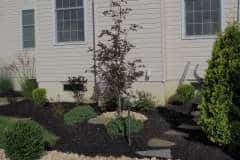 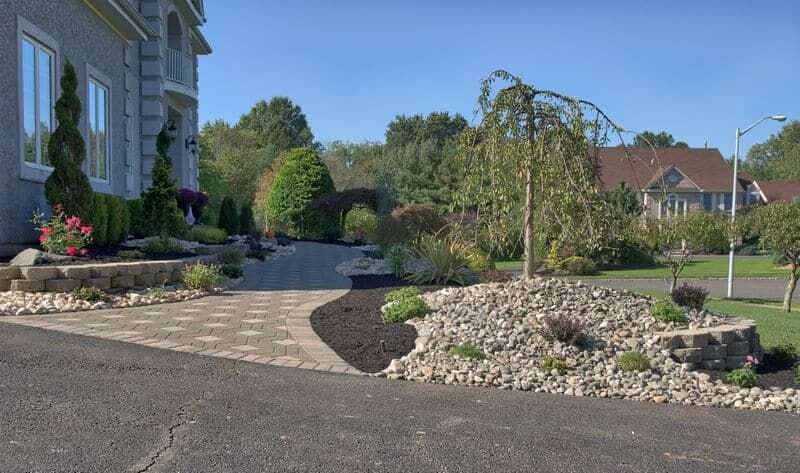 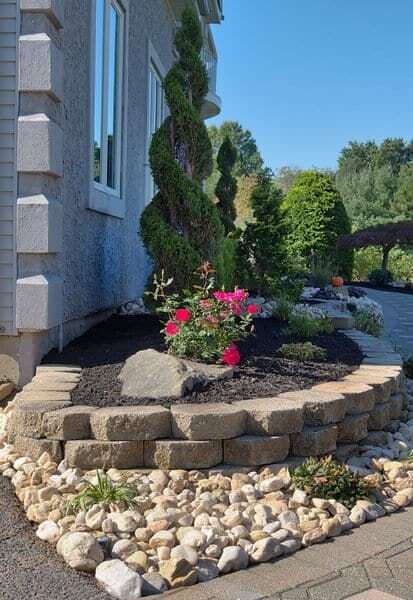 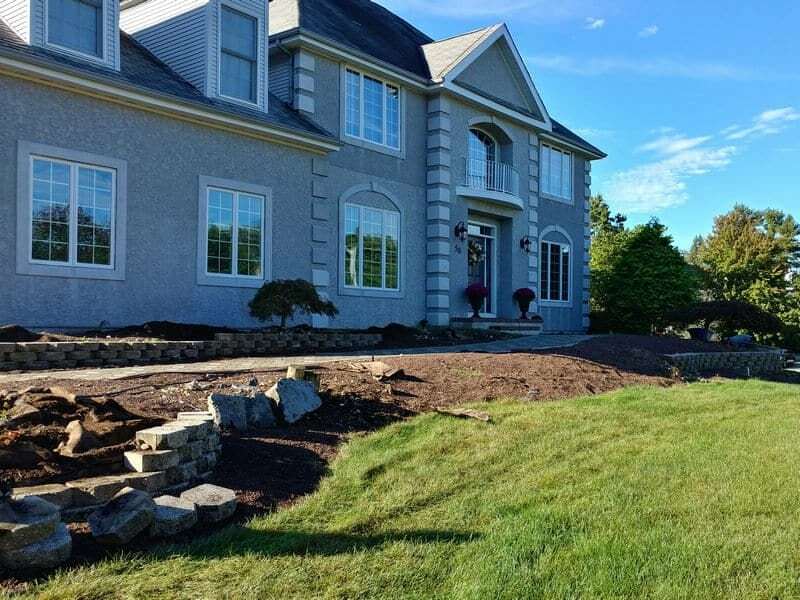 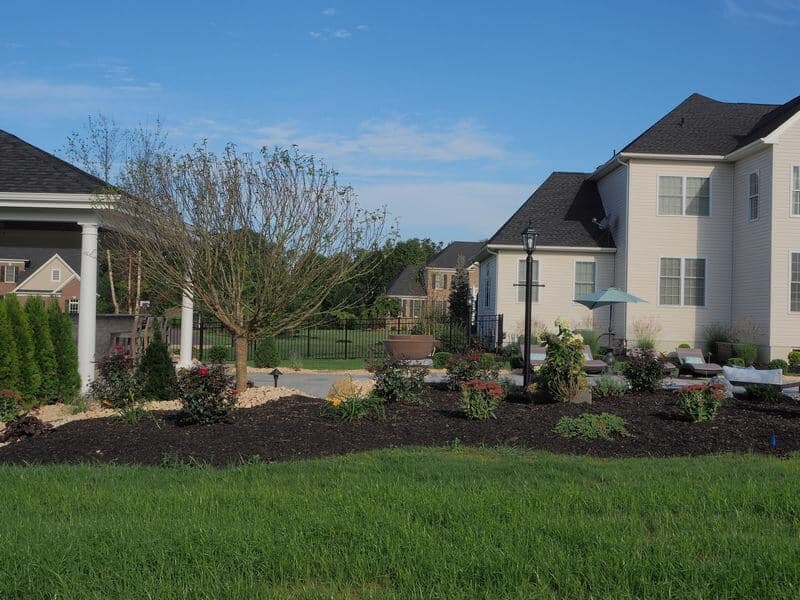 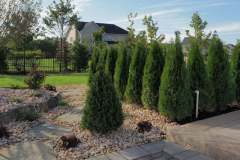 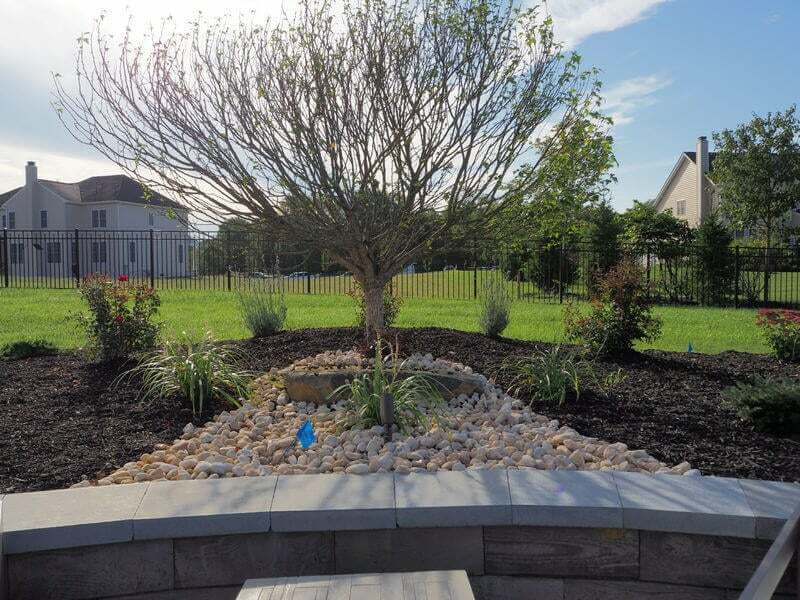 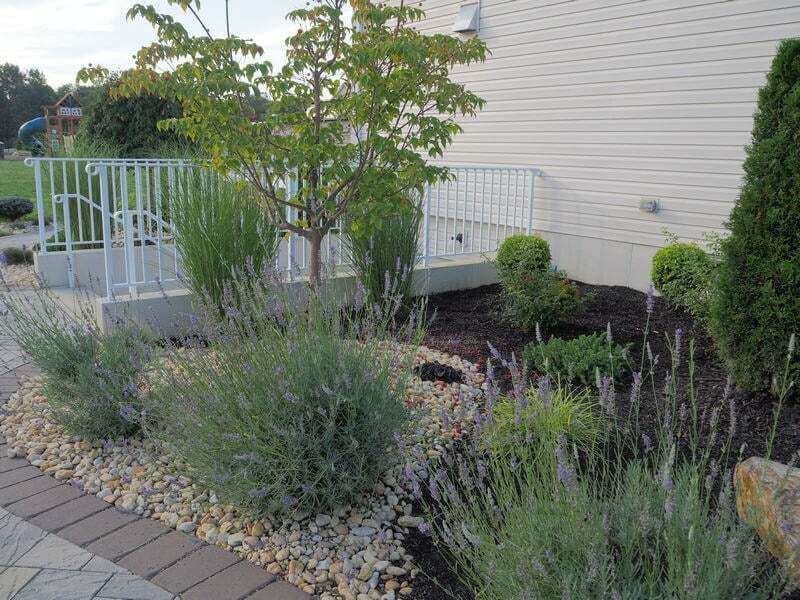 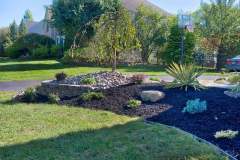 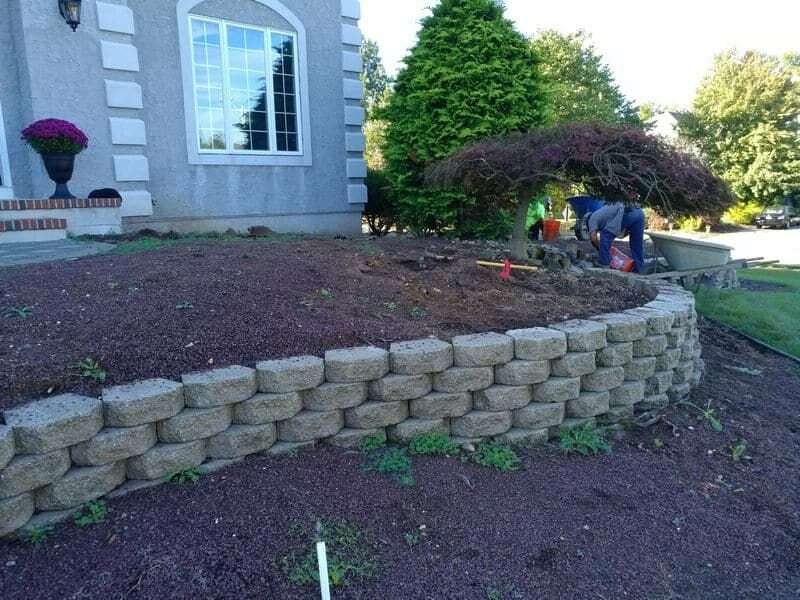 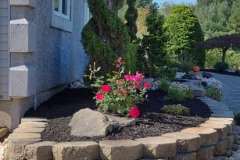 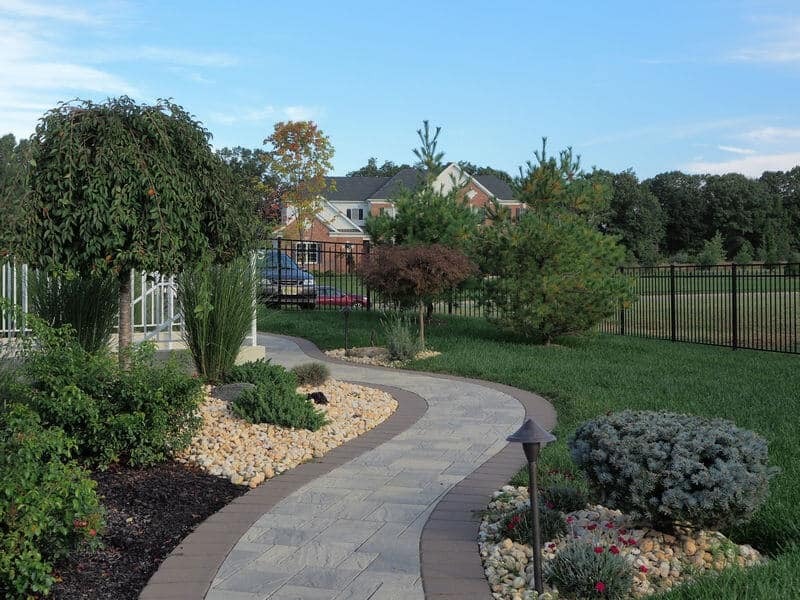 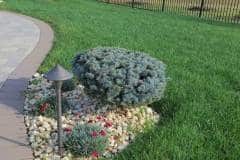 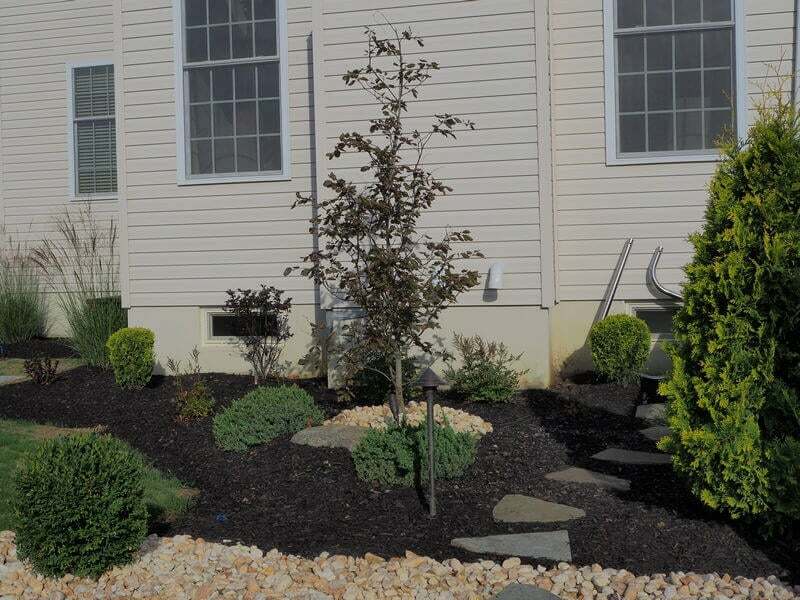 Out client has 15 year old landscaping that was detracting from the overall look of the home The landscaping needed to be brought up to date to modernize the look of the front yard. 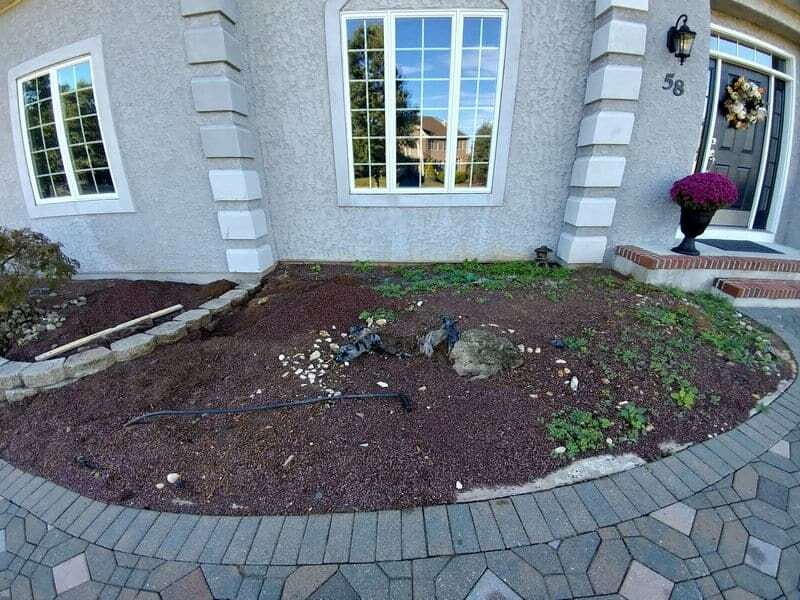 We replaced the majority of the original landscape that was in the front of the house. 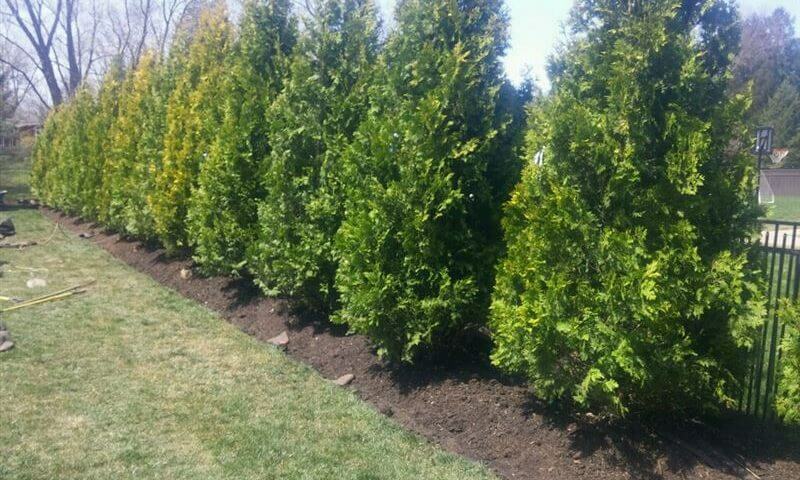 Per the clients wished we did transplant their Ilex Compacta shrubs kept some of their existing hedges. 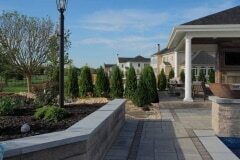 To keep the modern look our client was looking for we provided a full cleanup of the property. 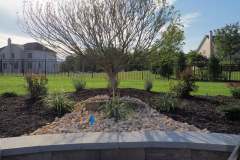 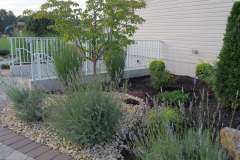 This included trimming the old hedges and cleaning up the original flower beds to make them look like part of the new design. 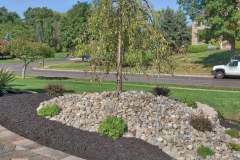 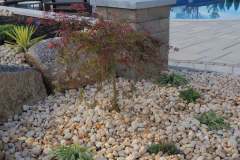 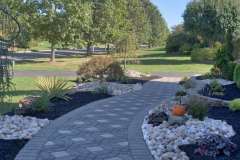 Also we did recycle a lot of the stone material used in the original landscape design to keep things within our clients budget. 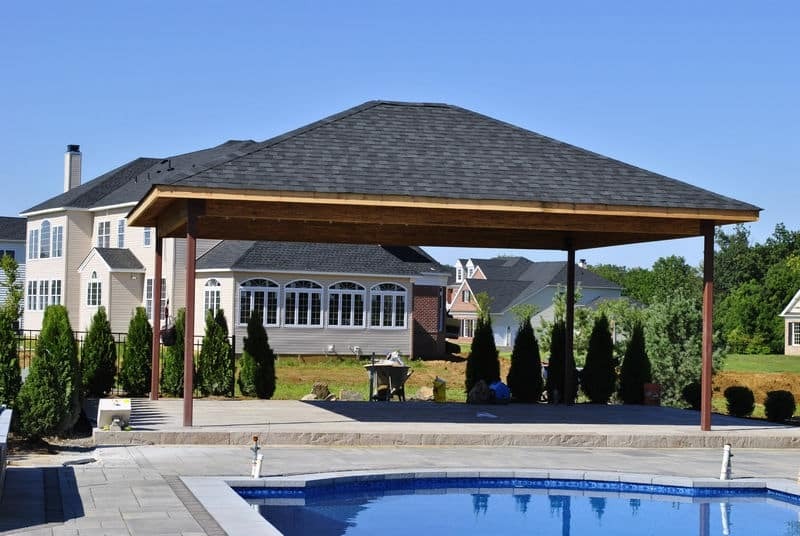 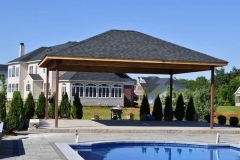 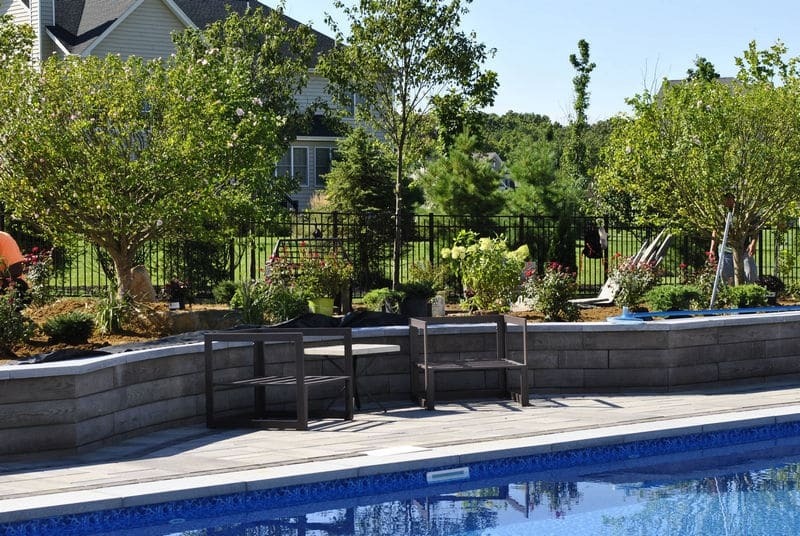 Replace an existing pool and empty back yard into a complete outdoor entertainment area tying it into an existing deck. 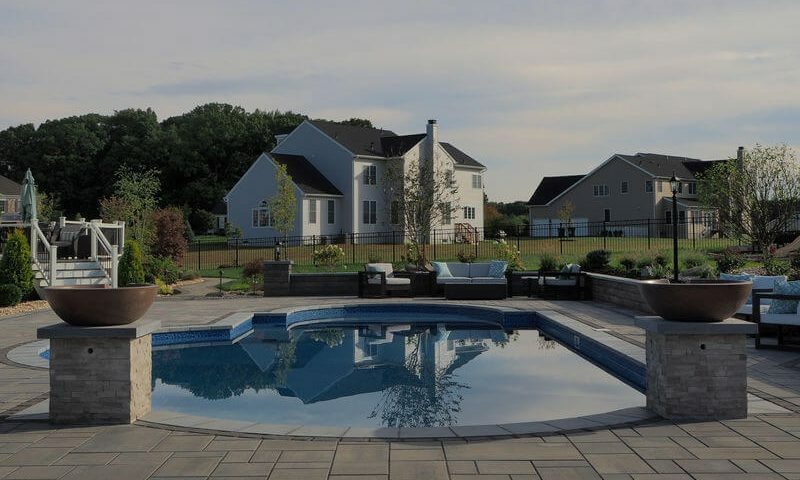 After the installation of the pool we designed and installed a 1085 sq. 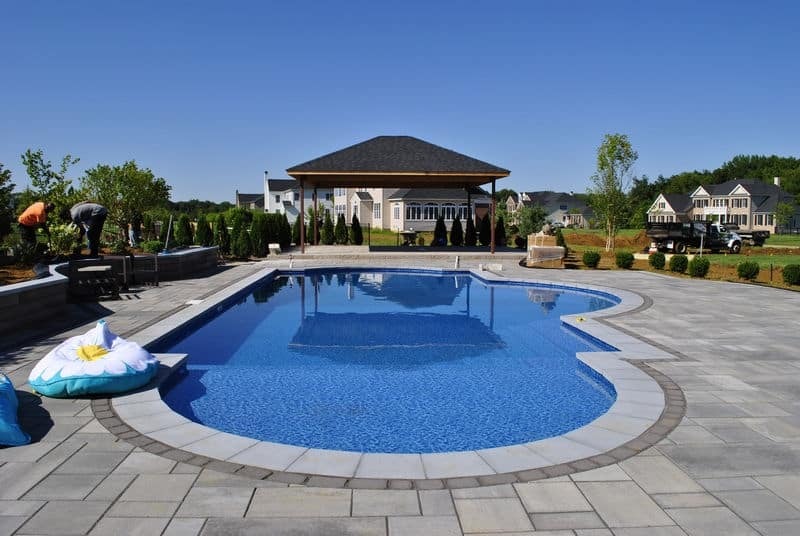 ft. pool deck with double borders. 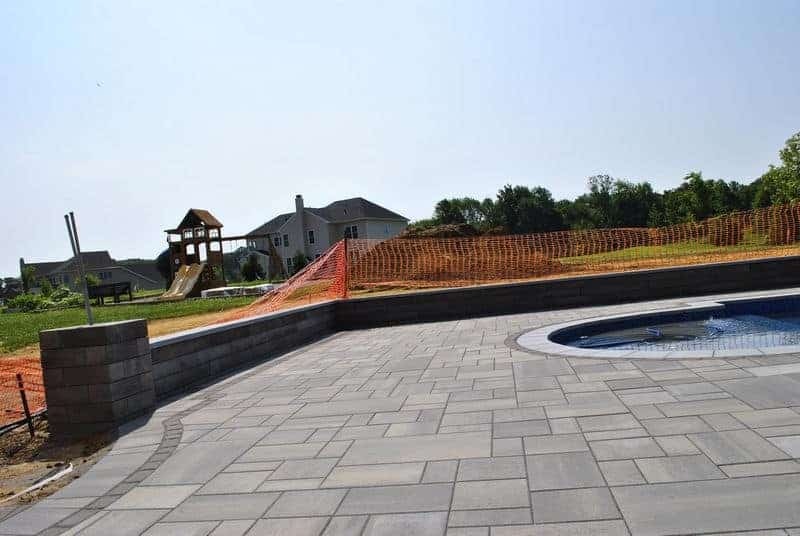 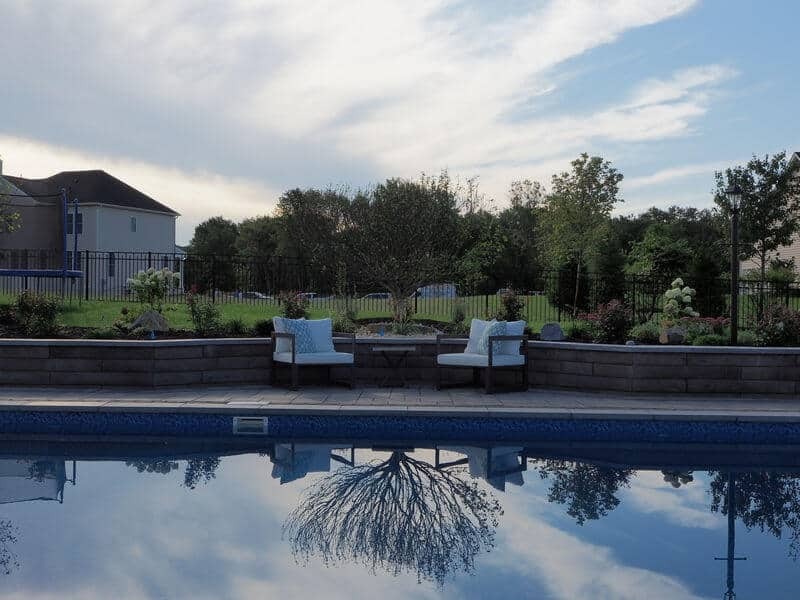 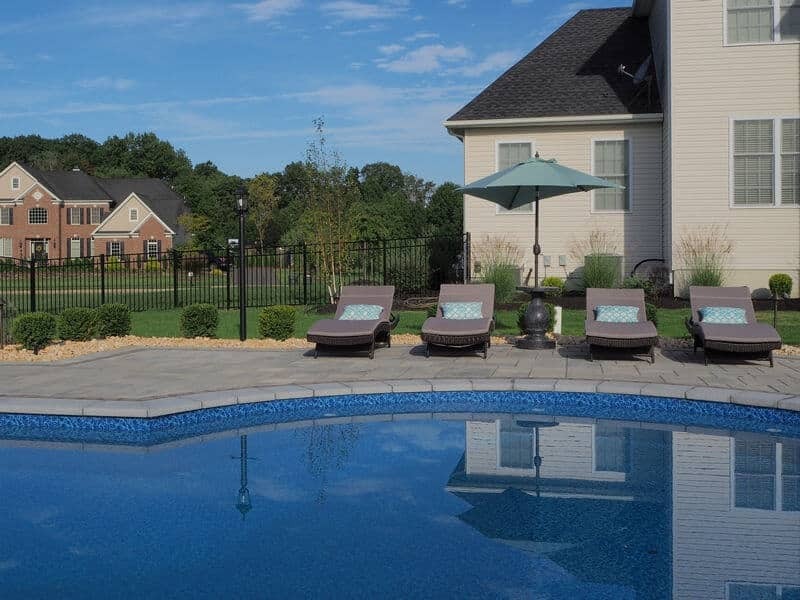 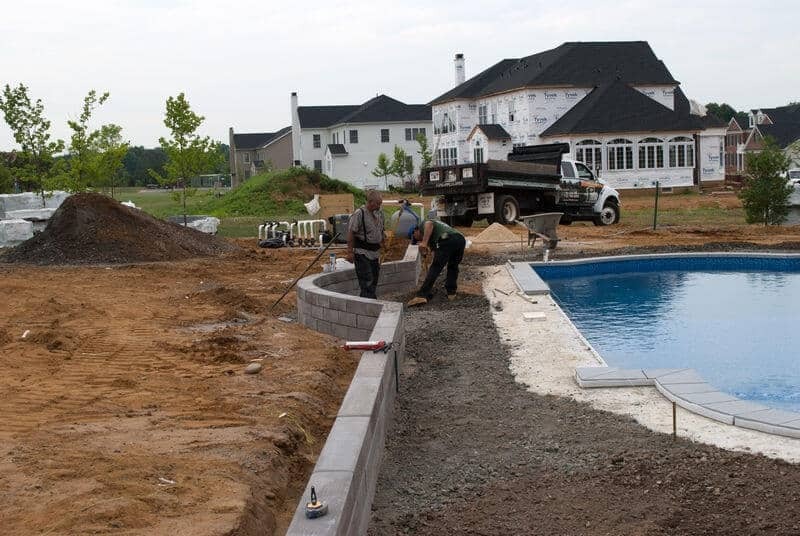 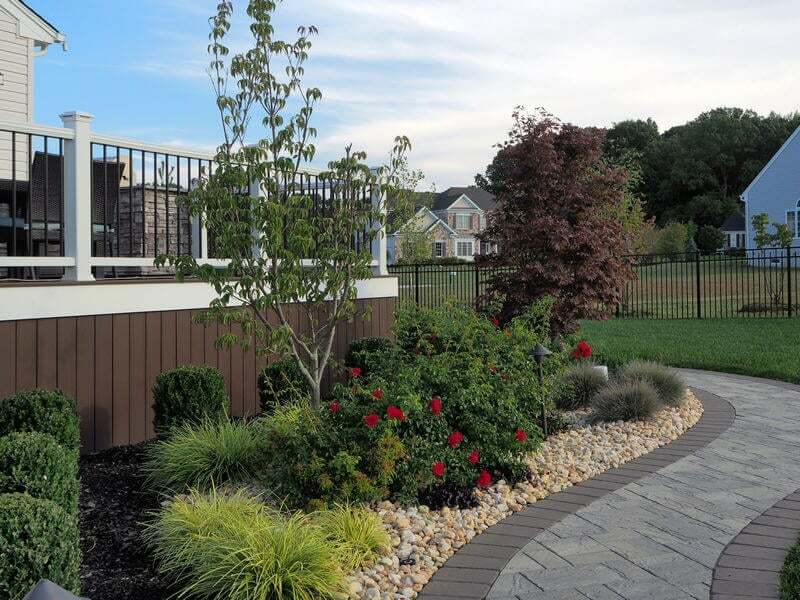 On the shallow end and rear length of the pool a short retaining wall was put in place to add landscaping beds around the pool and create the feeling of an outdoor living space. 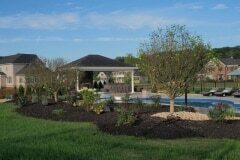 We included some pillars for decoration and lighting with 2 of them featuring large fire bowls on the pavilion side of the pool. 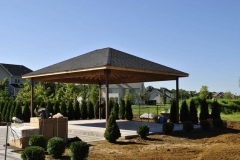 A custom built 20′ x 16′ pavilion was built on top of a 420 sq. 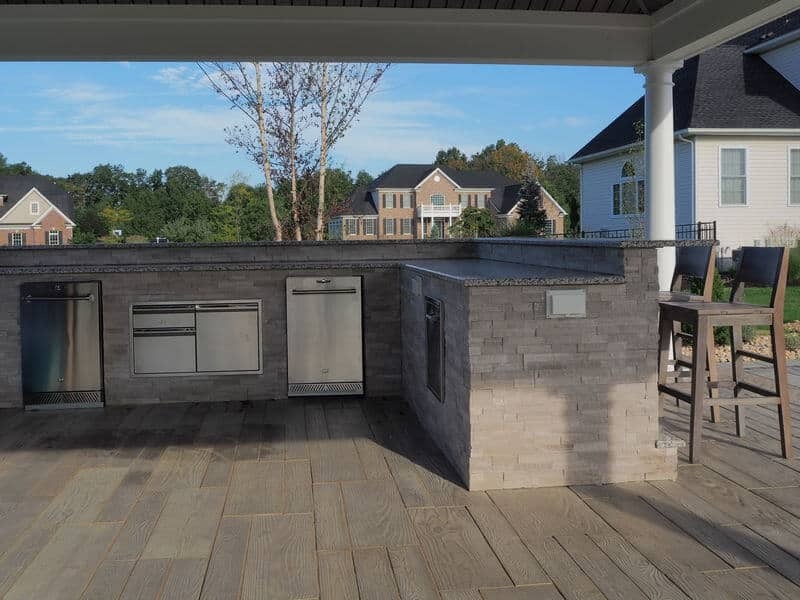 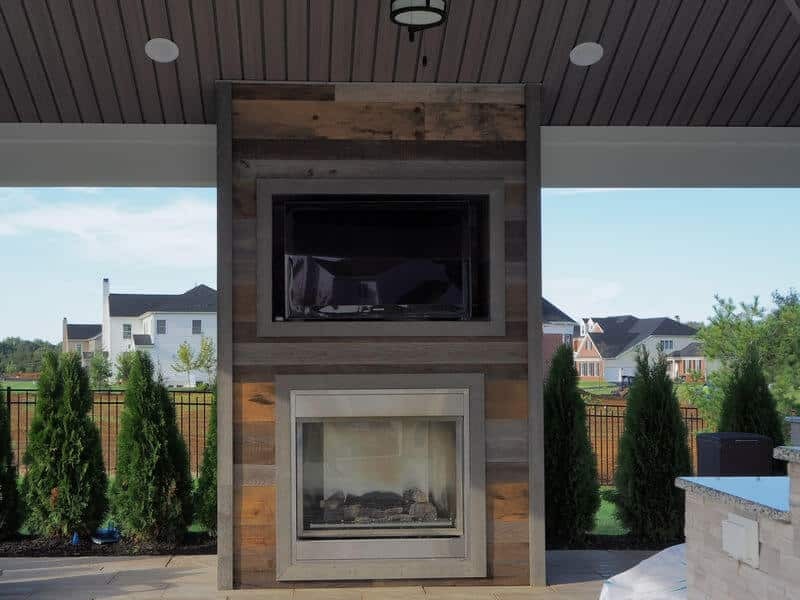 ft. patio area featuring a bar area with MSI natural ledger stone panels and a 42″ steel insert natural gas reclaimed wood fireplace with a TV. 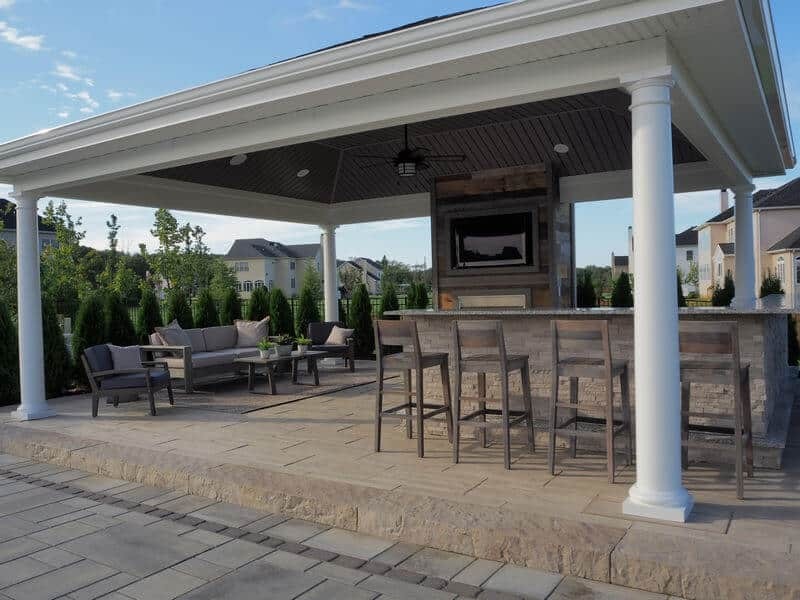 We also installed a complete outdoor lighting package and a full landscape design complimenting their outdoor entertainment area. 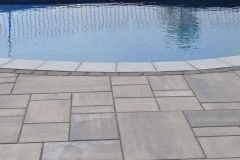 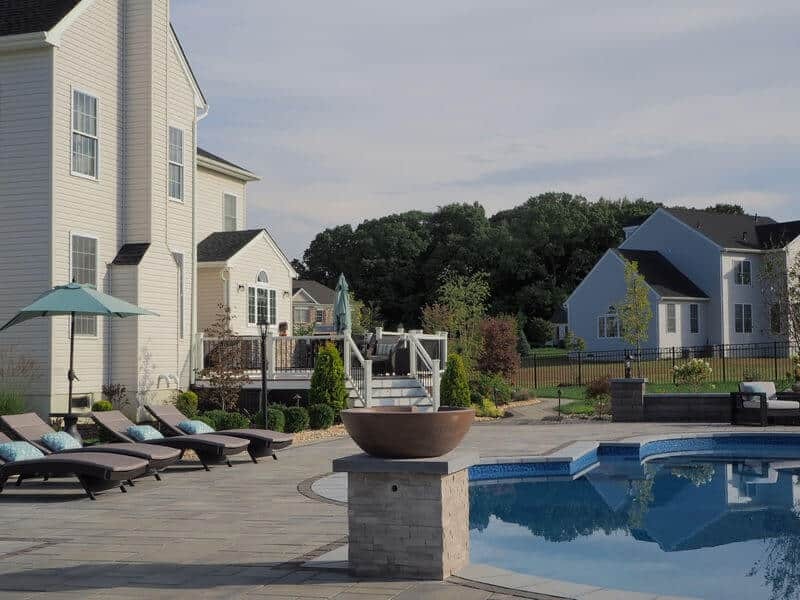 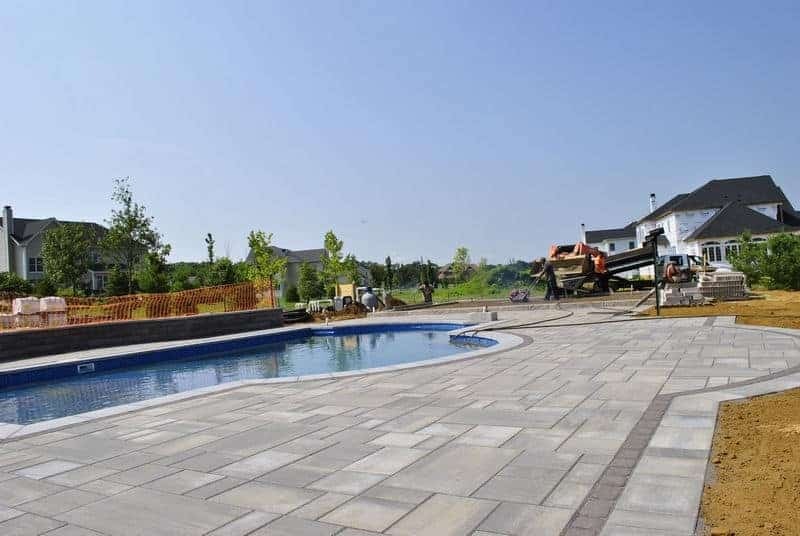 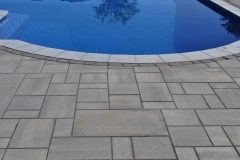 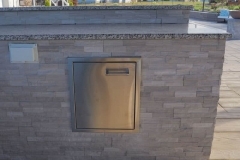 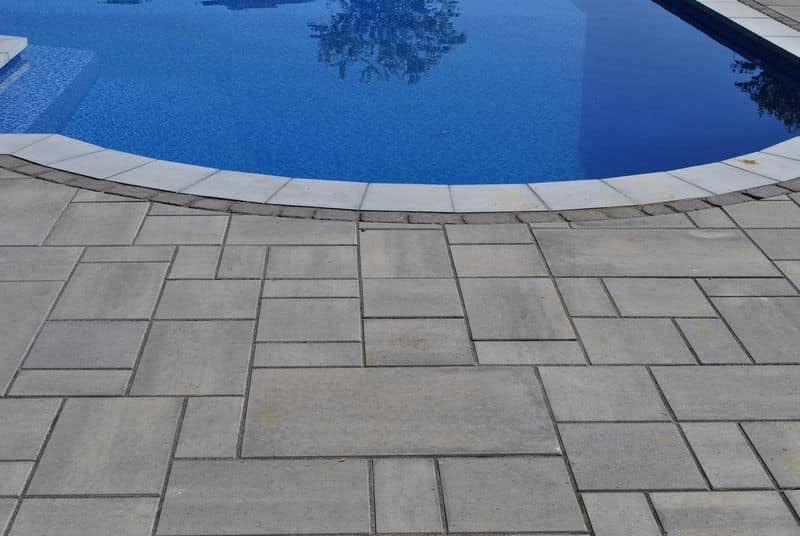 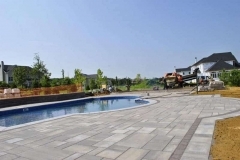 All pavers, wall blocks, caps, and pool coping are from Techo-Bloc. 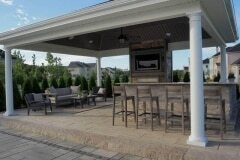 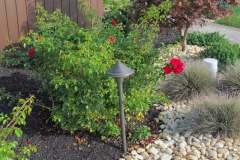 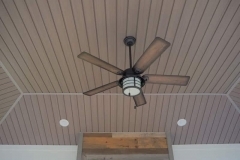 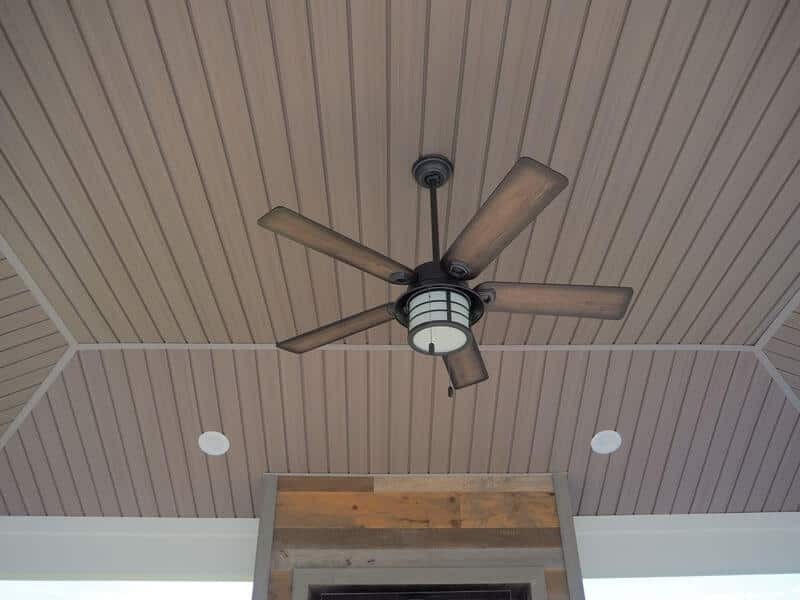 Outdoor lighting comes from Coastal Source and the bar appliances are all Delta Heat products. 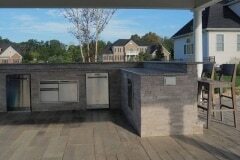 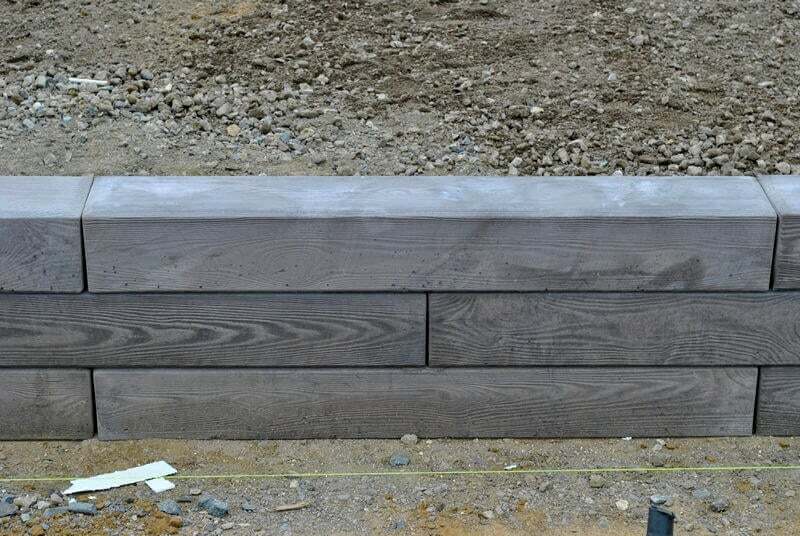 The two pillars supporting the fire bowls were also built with MSI natural ledger stone panels matching the bar area. 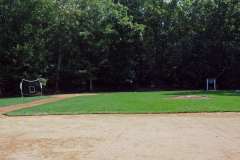 220 sq. 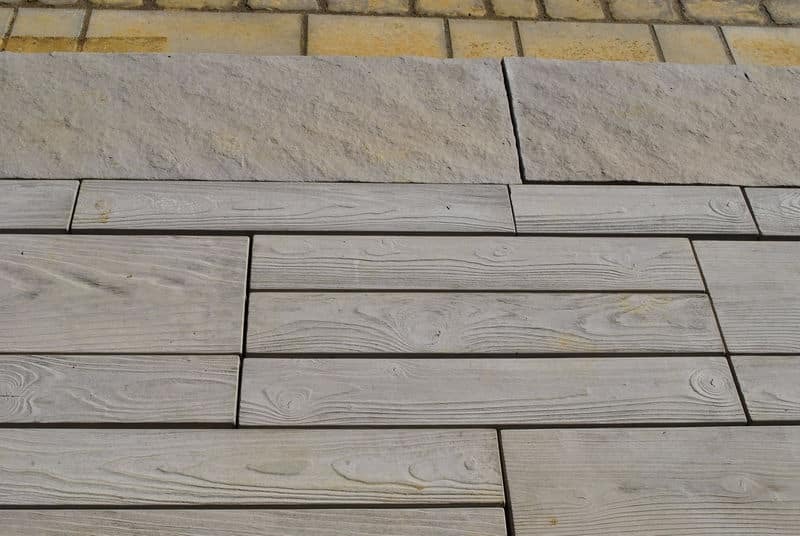 ft. of Techo-Bloc Borealis smoked pine wall block. 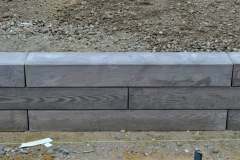 80 ln. 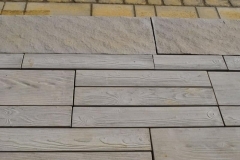 ft. of Piedmonte riviera wall caps. 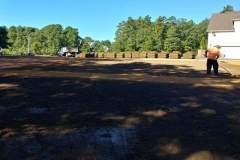 1085 sq. 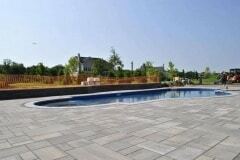 ft. of Techo-Bloc BLU60 shale gray pavers for the pool deck. 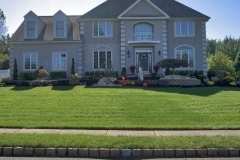 362 ln. 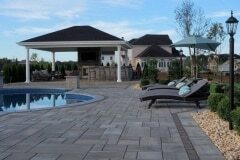 ft. of Techo-Bloc Villagio chocolate brown pavers for the inside border. 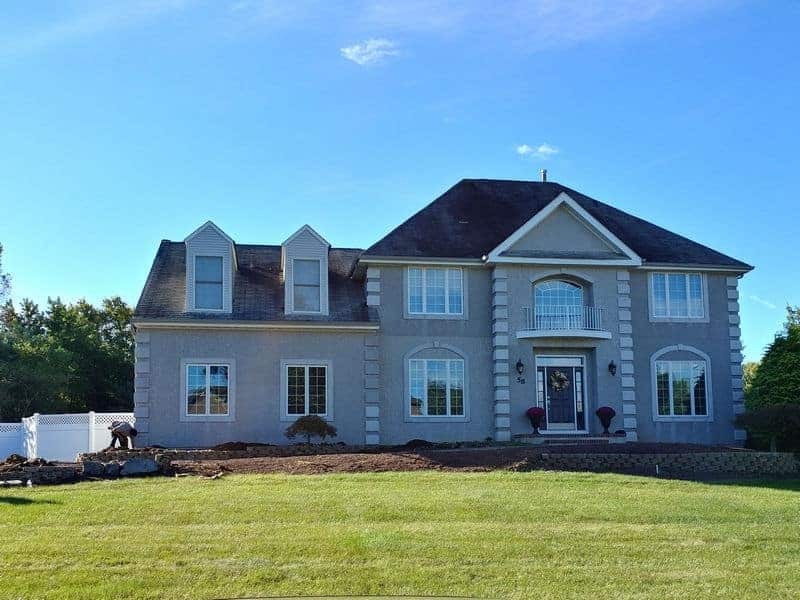 465 ln. 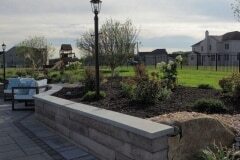 ft. of Techo-Bloc Blue 60 shale gray pavers for the outside border. 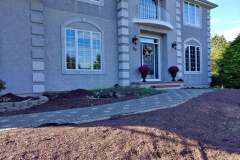 132 ln. 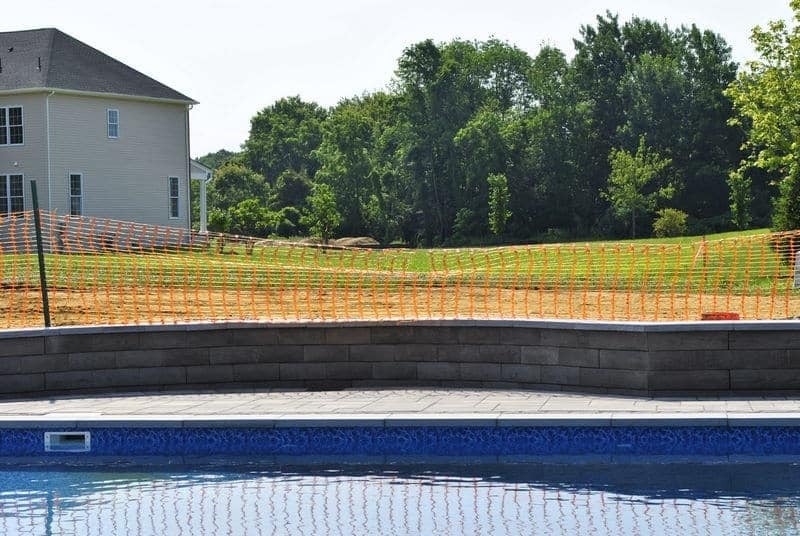 ft. or Techo-Bloc Piedemonte riviera pool coping. 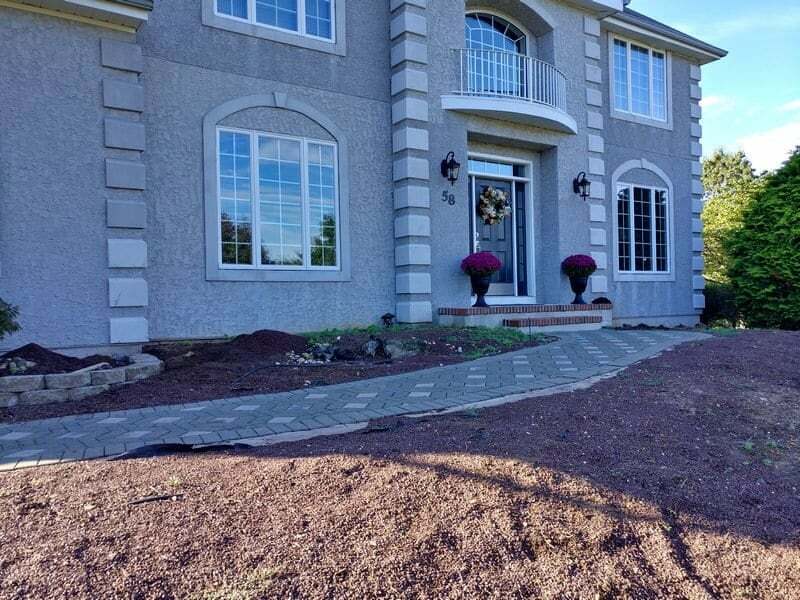 119 ln. 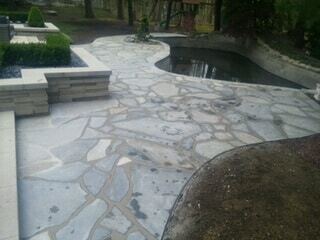 ft. of Techo-Bloc Parisian shale grey pavers for the coping border. 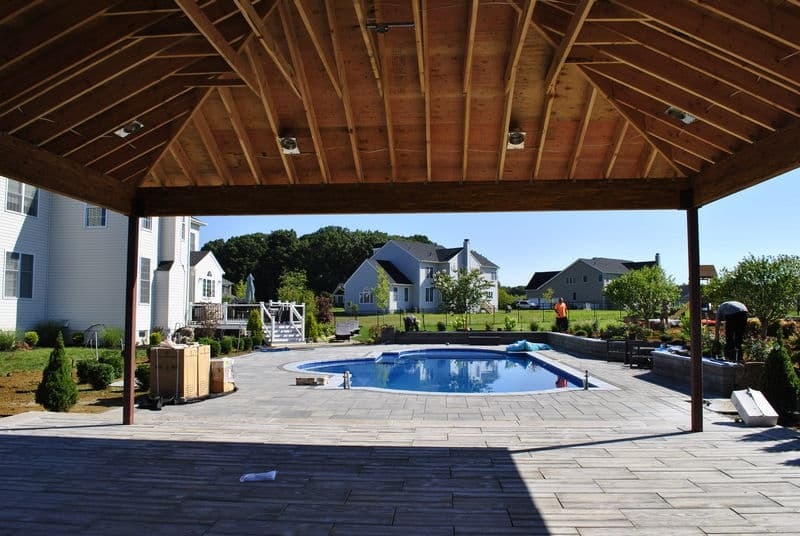 2 – 2′ x 2′ x 3′ pillars by the pool entrance built with Borealis smoked pin block and Piedmonte riviera caps. 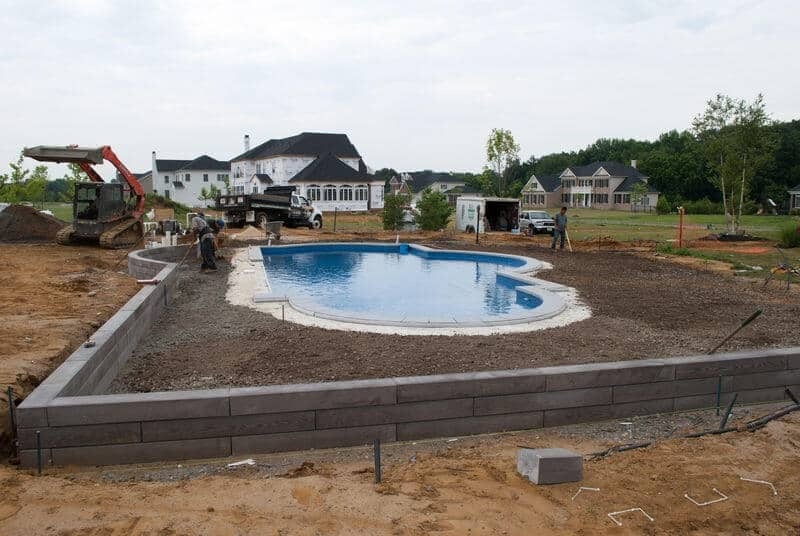 2 – 2′ x 2′ x 2′ pillars at the far end of the pool to hold the two large firebowls with MSI ledger stone veneers. 20′ x 16′ custom built pavilion with upgraded vinyl ceiling. 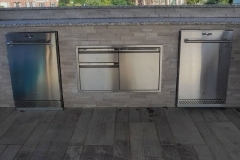 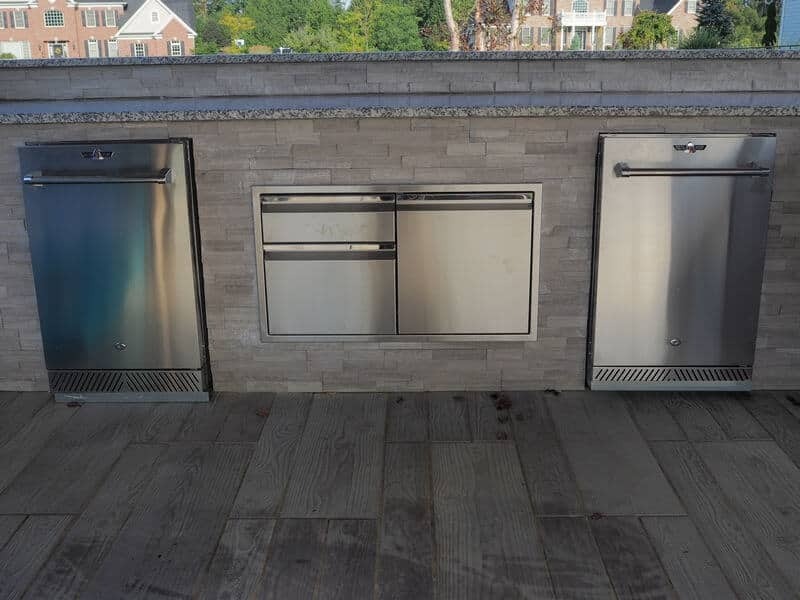 25 ft. L shaped bar with MSI natural stone ledger panels with a Delta Heat refrigerator and built in stainless steel storage units. 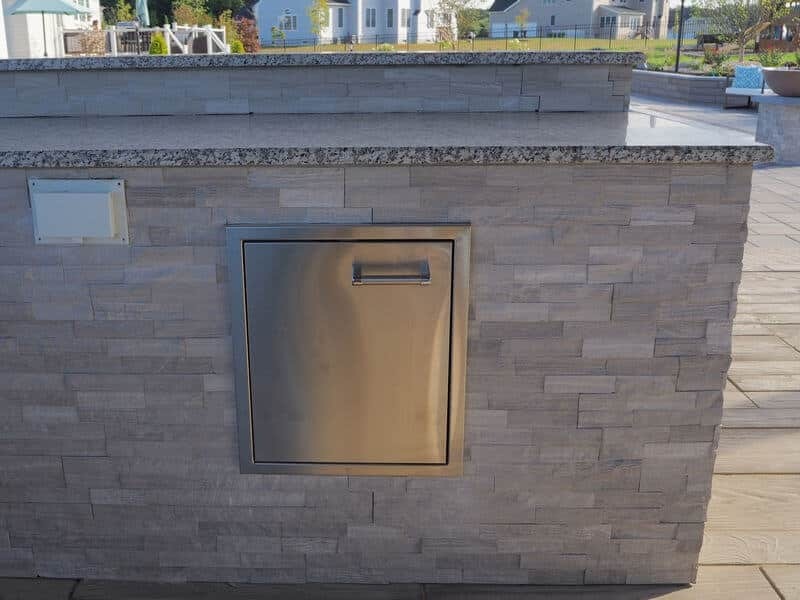 42″ natural gas vent free fireplace with a recessed area for a TV. 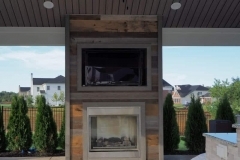 Stainless steel fireplace insert with a reclaimed wood exterior. 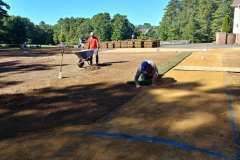 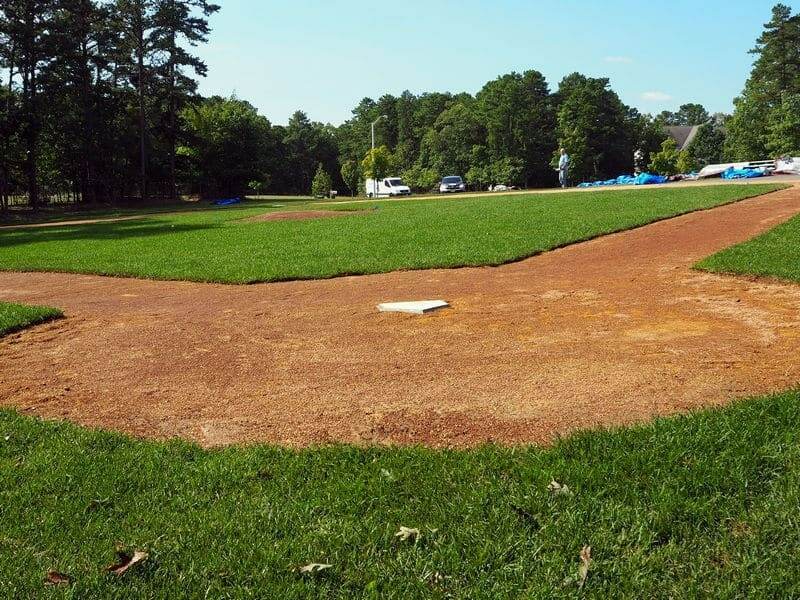 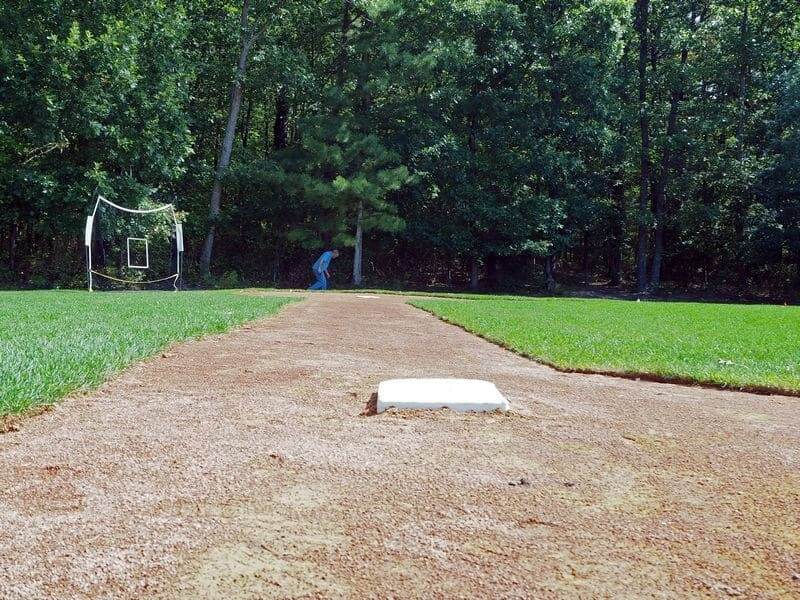 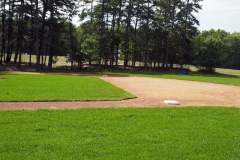 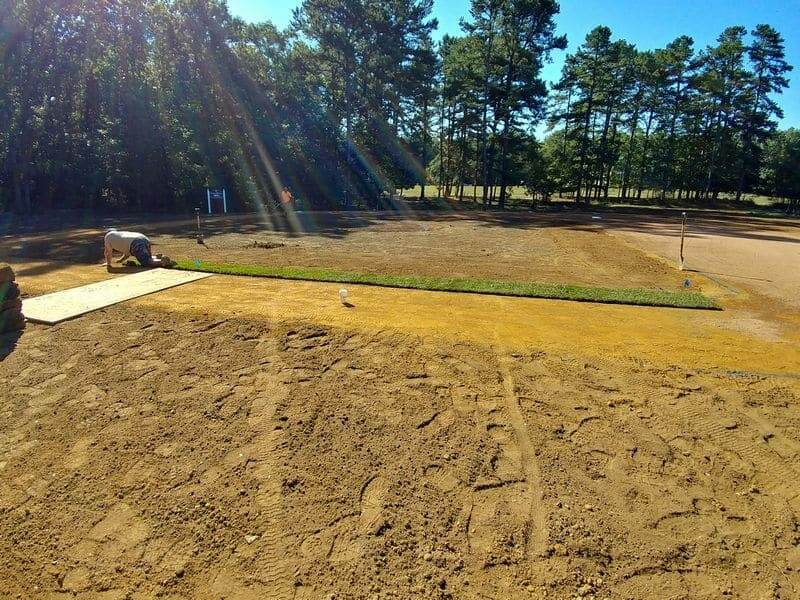 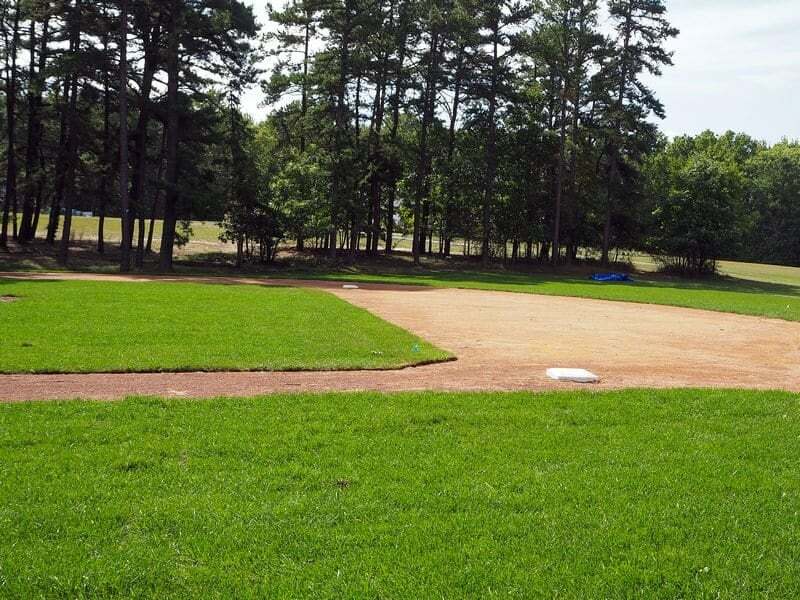 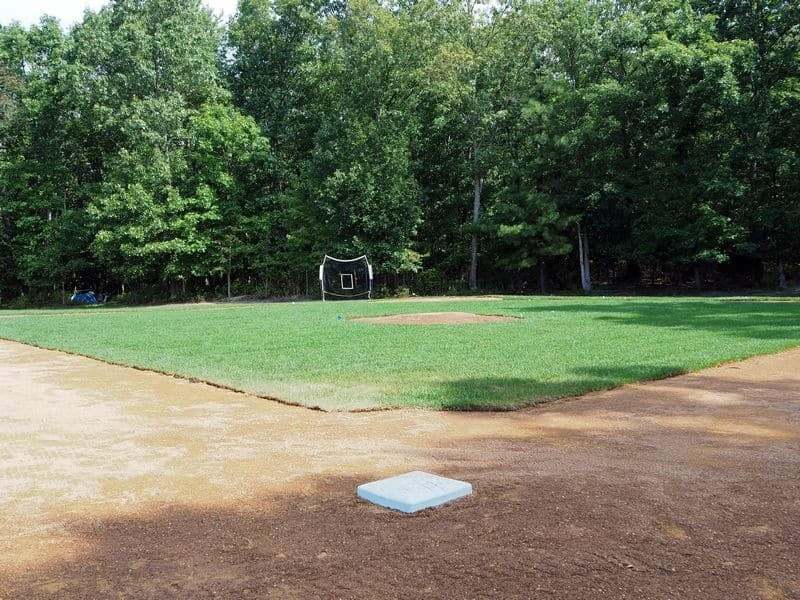 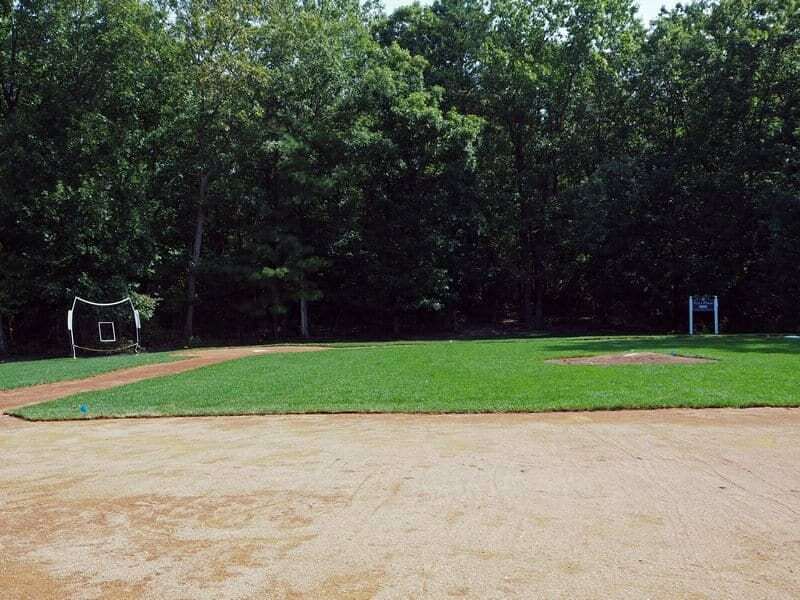 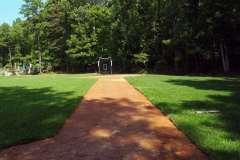 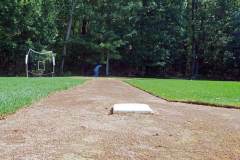 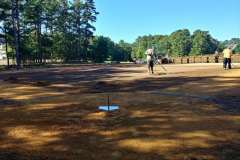 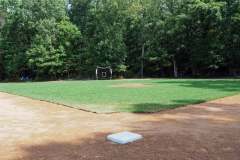 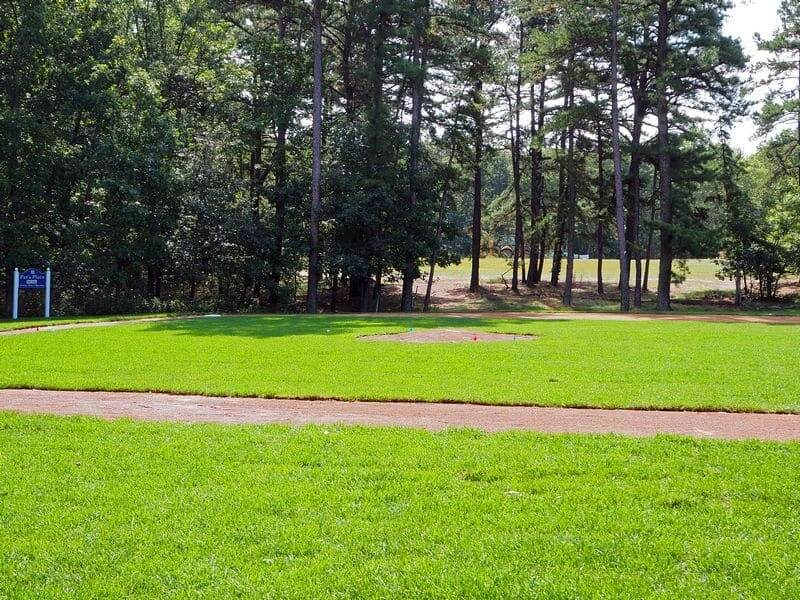 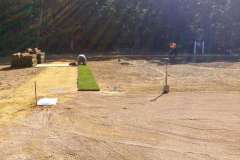 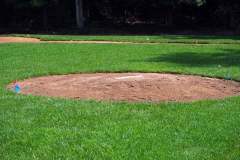 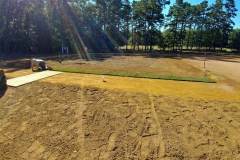 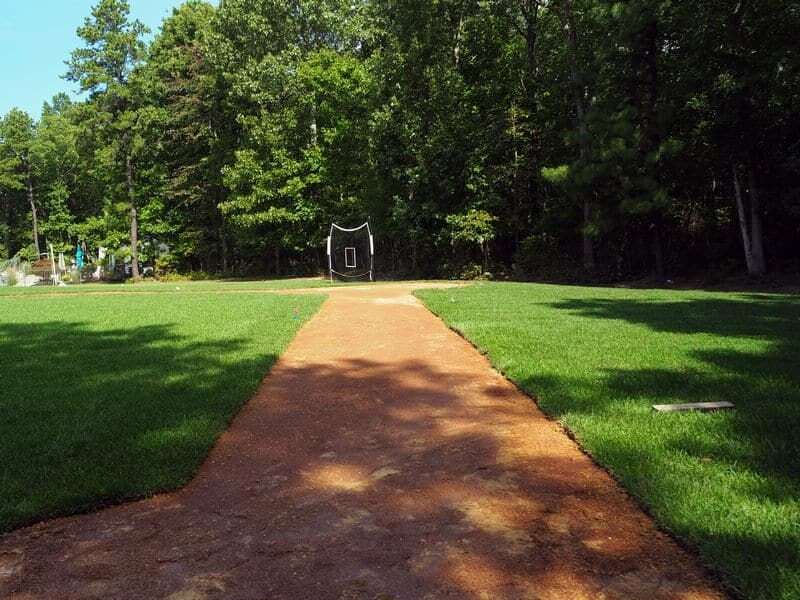 Our clients needed reliable a practice field for their child’s little league baseball team. 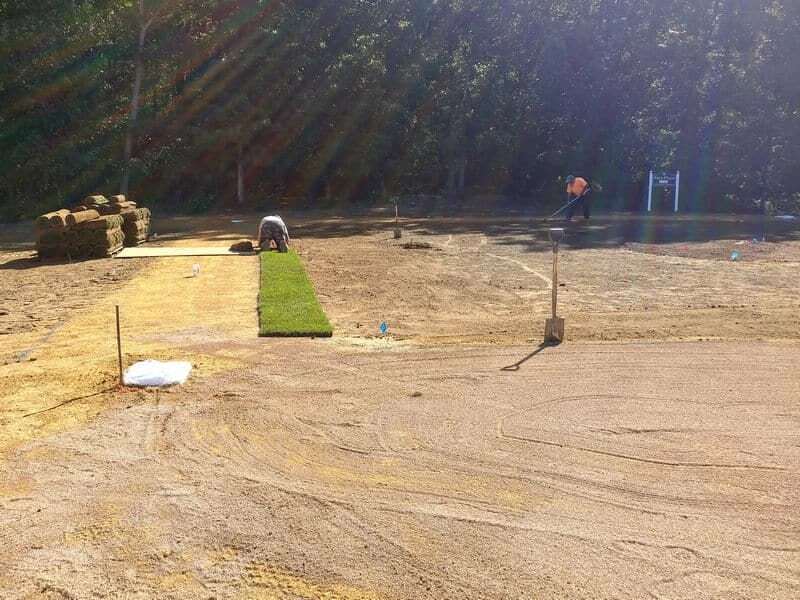 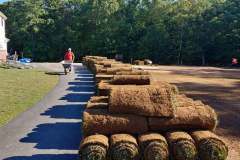 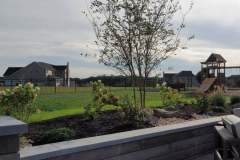 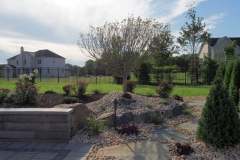 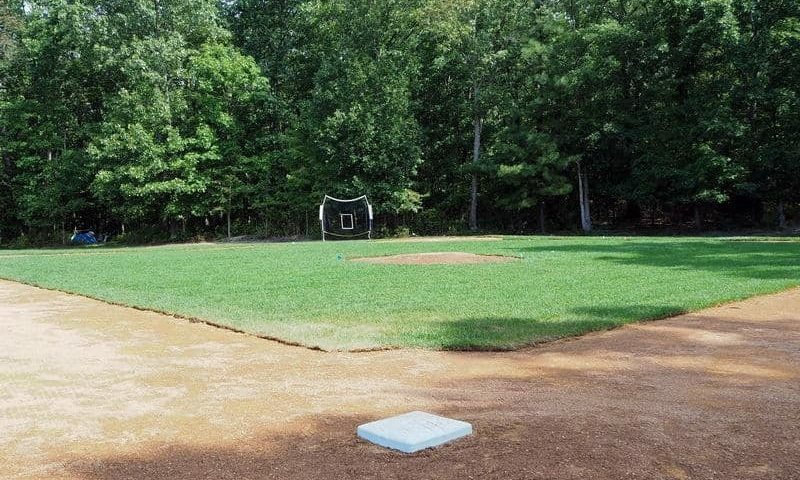 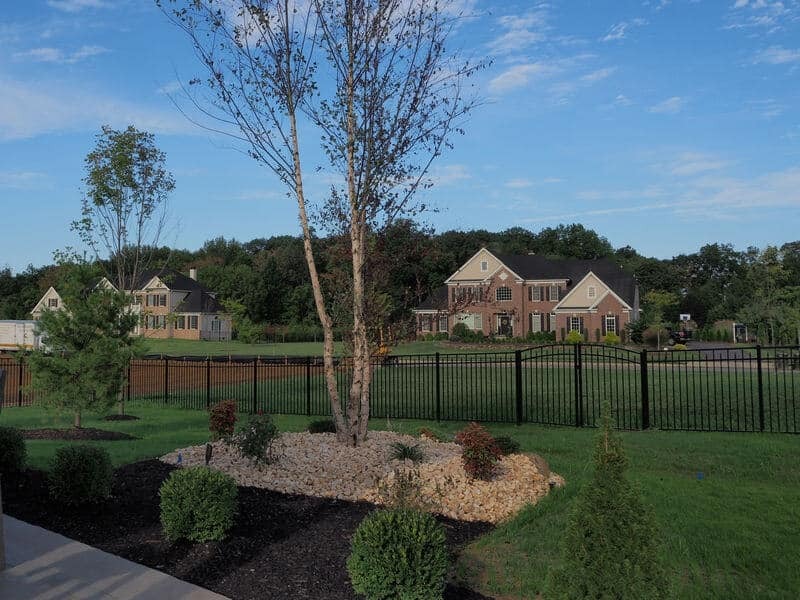 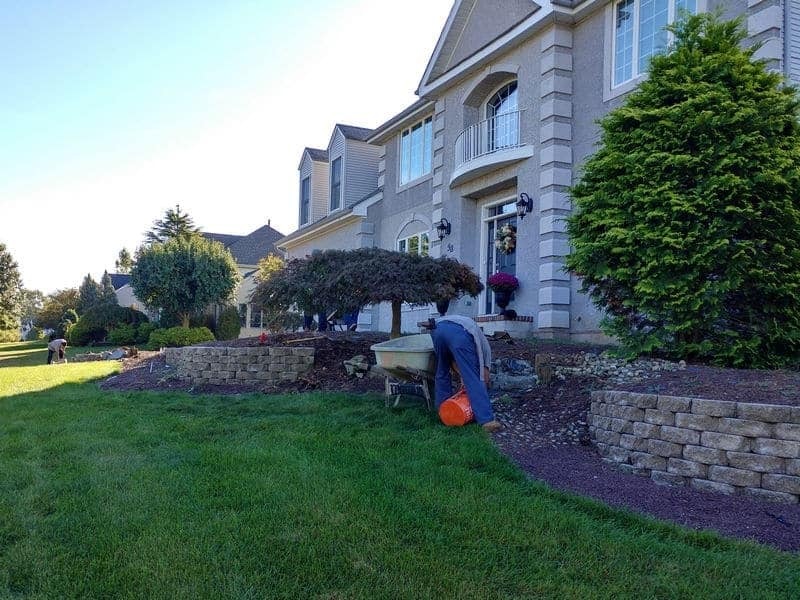 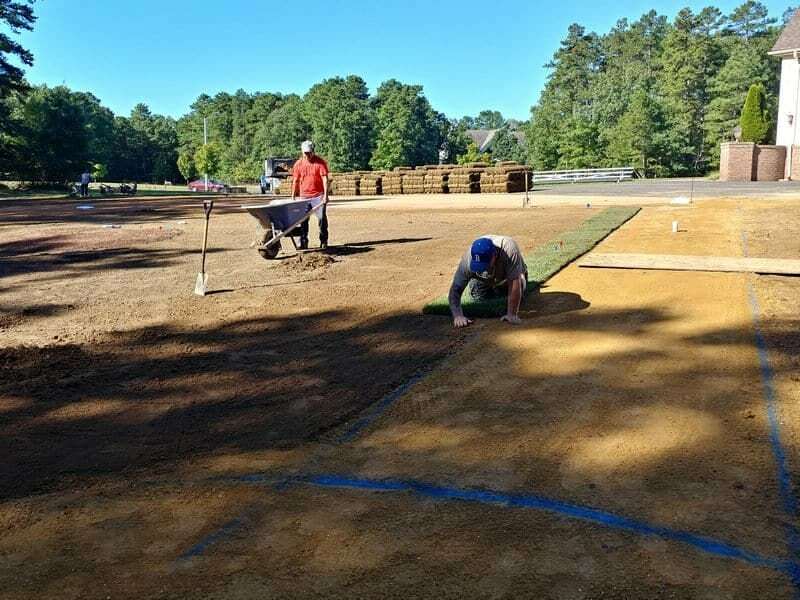 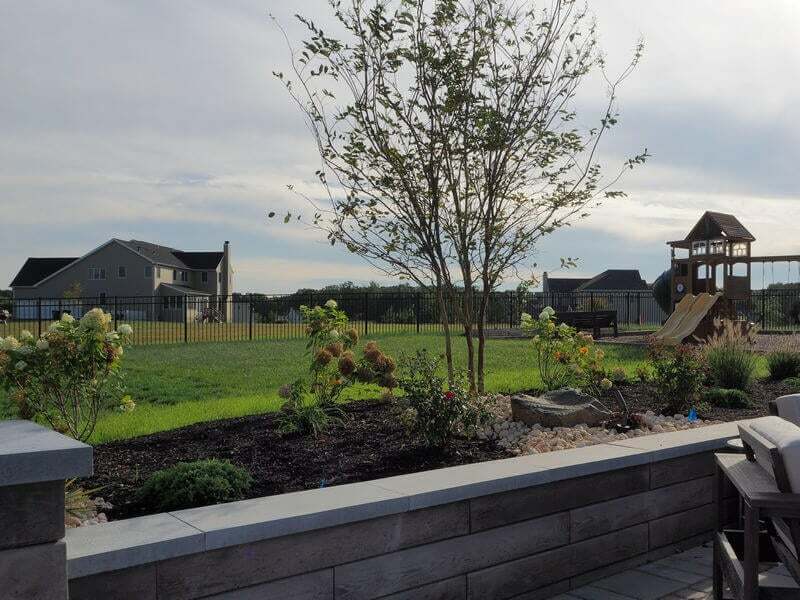 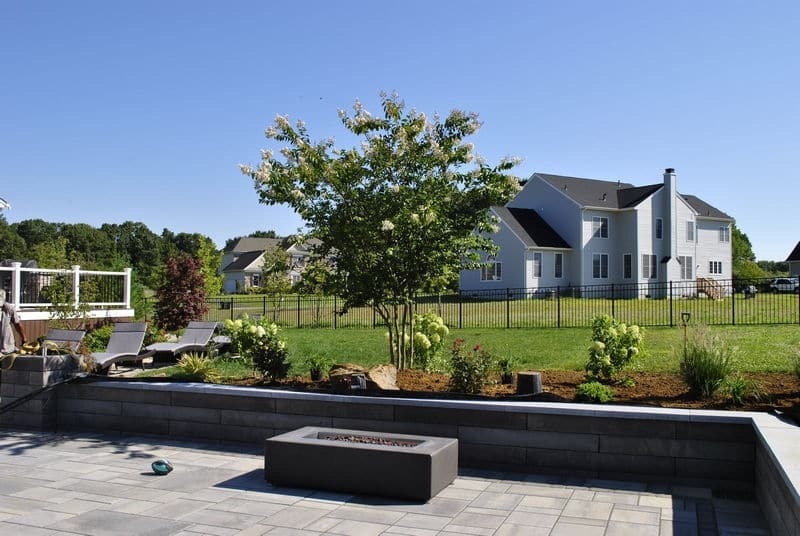 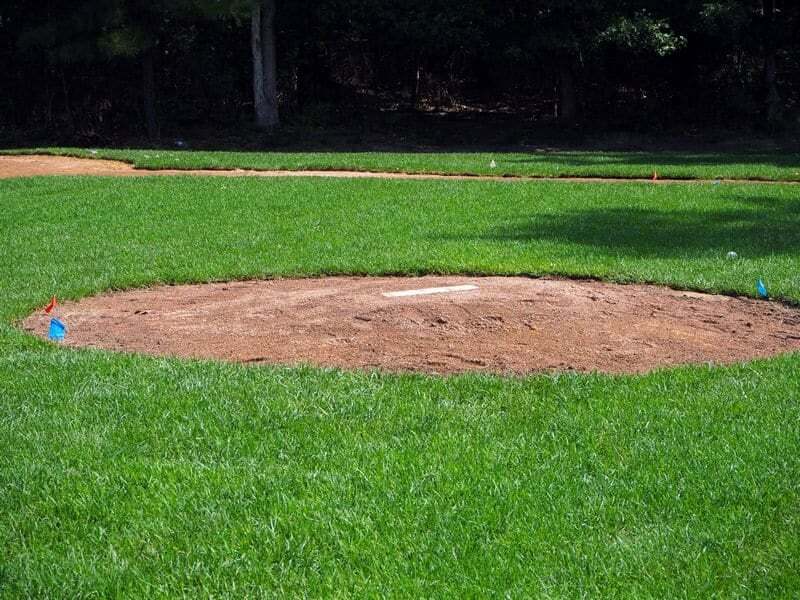 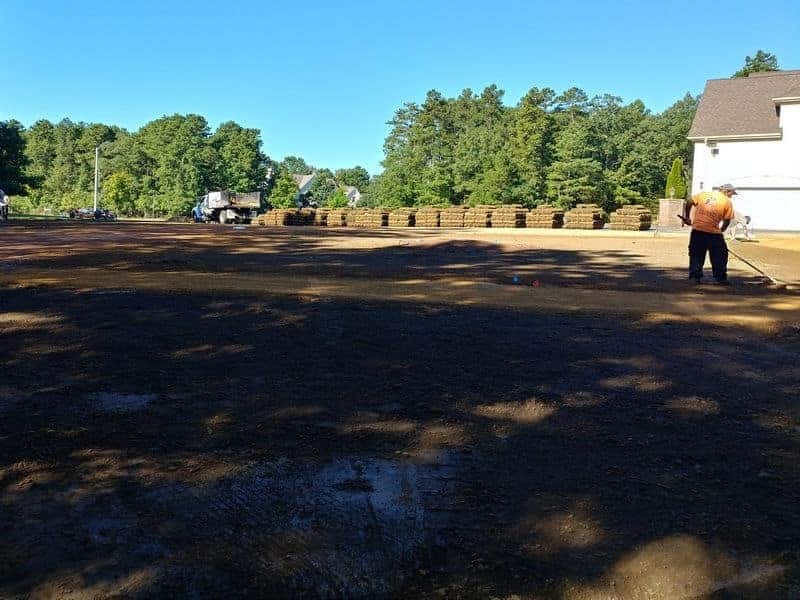 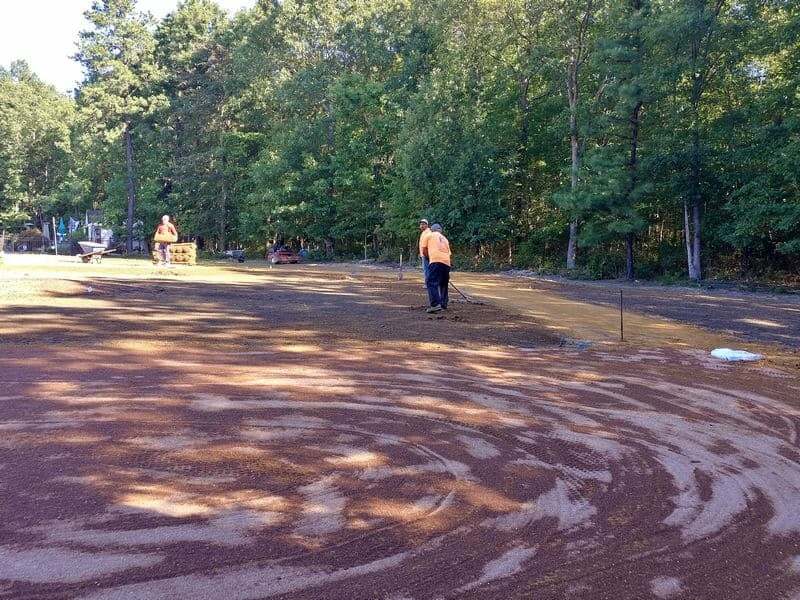 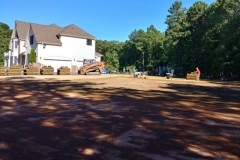 With an ample side yard they decided to build instead of looking for a local field that was properly maintained and available when their team needed it. 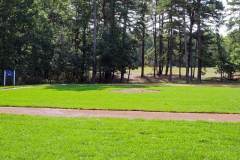 With an abundance of land on the side of their property our lead designer and resident baseball fanatic went to work. 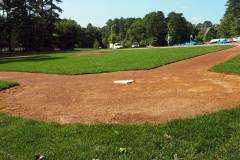 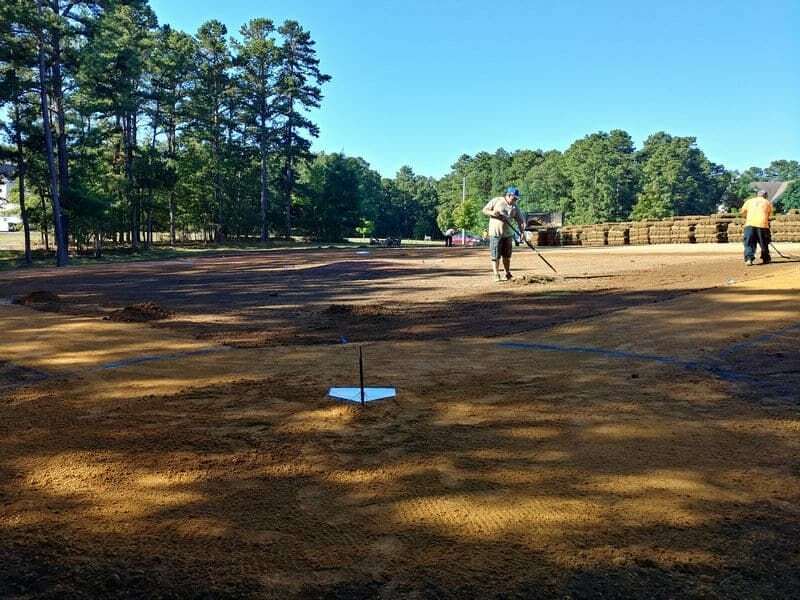 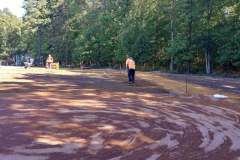 He designed, laid out, and helped build a regulation size little league infield. 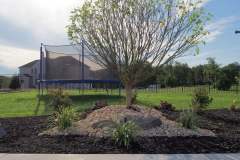 To help protect the house a removable baseball netting system was devised to be used when the kids are on the field. 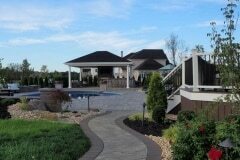 8,200 sq. ft. of sod. 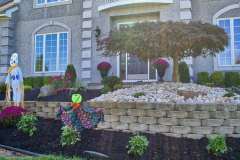 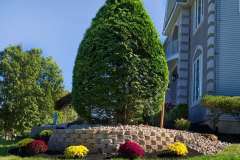 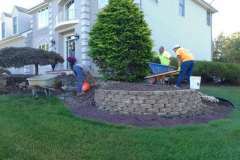 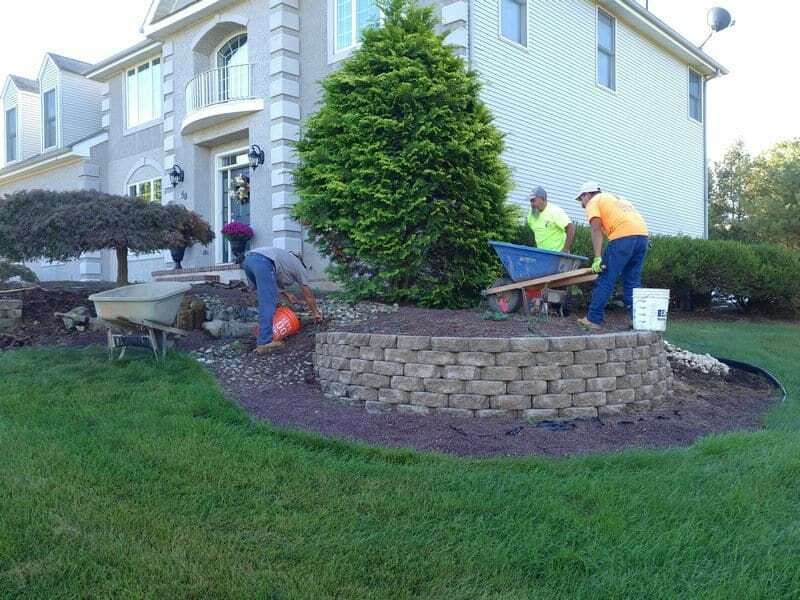 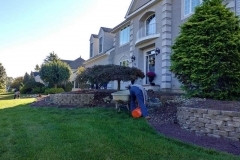 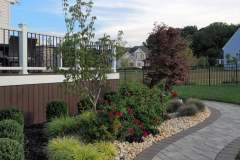 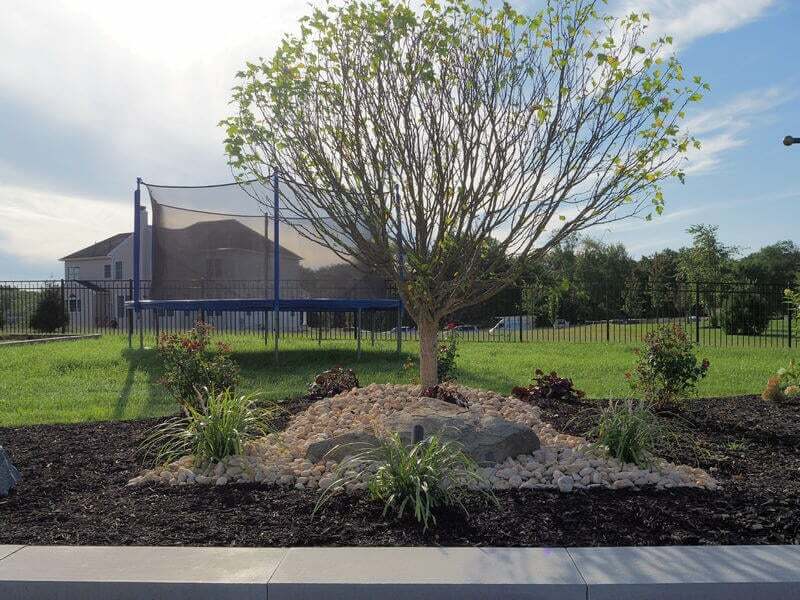 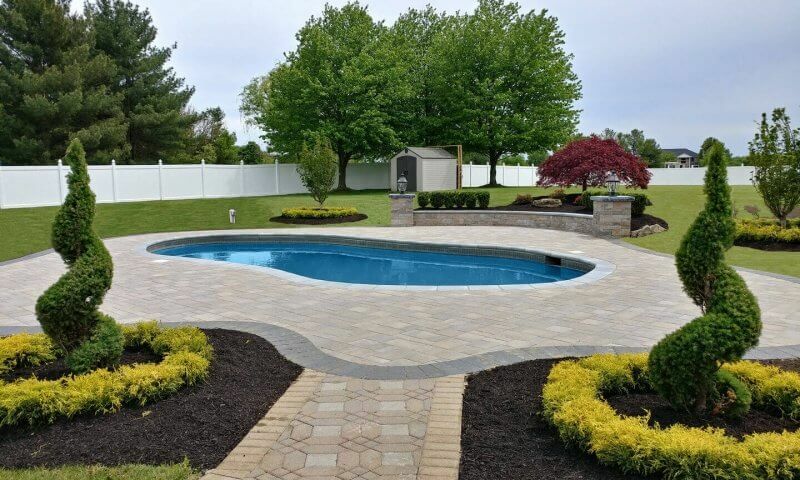 Our long time client in Manalapan, NJ wanted to change the look of her pool area and back yard. 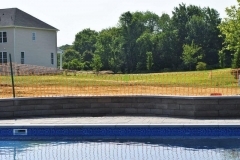 Our designers created custom poolscape design around their pool. 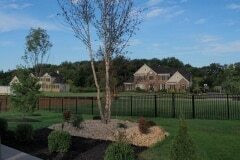 In addition to that we installed a privacy hedge along behind the pool fence. 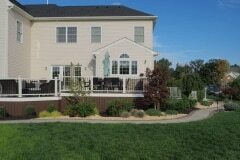 The client also wanted to replace the grass under her deck with stone for easy maintenance. 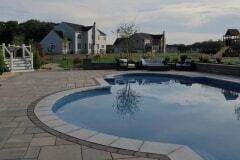 To complete the remodel of their back yard we installed new sod inside the pool area and from the driveway to the pool. 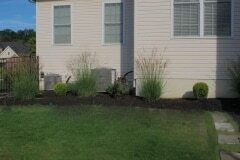 Our latest client in wanted to refresh their entire property. 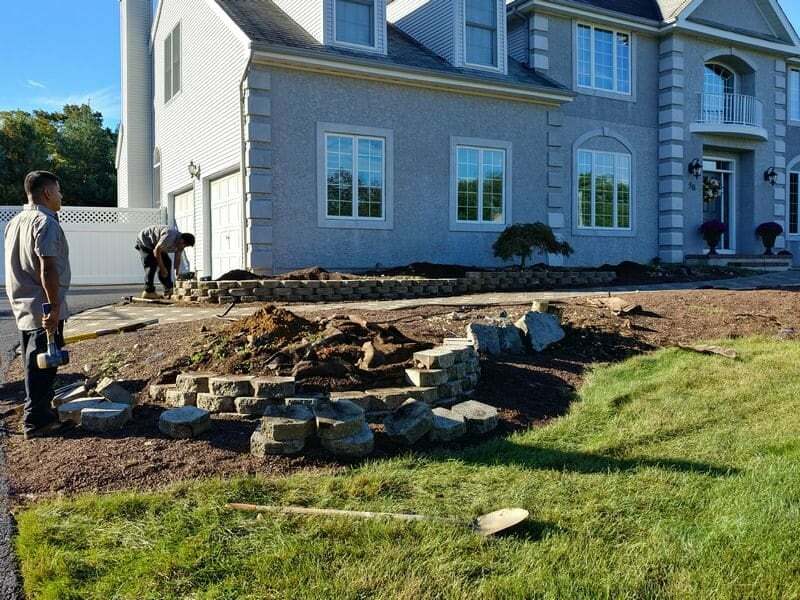 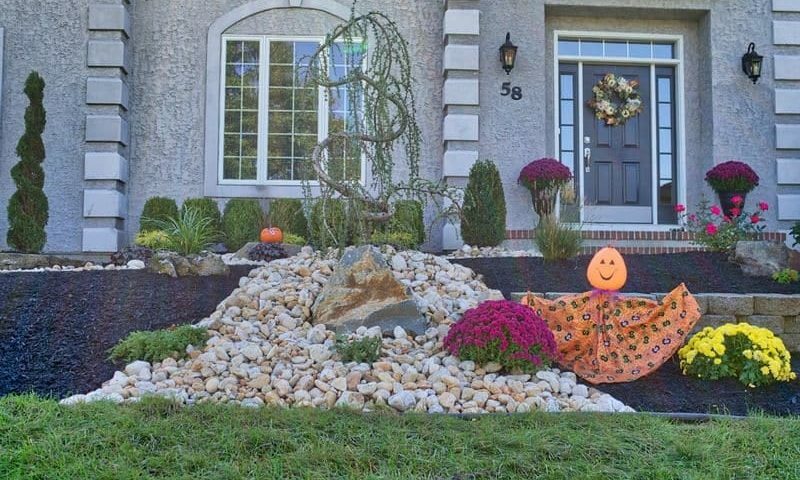 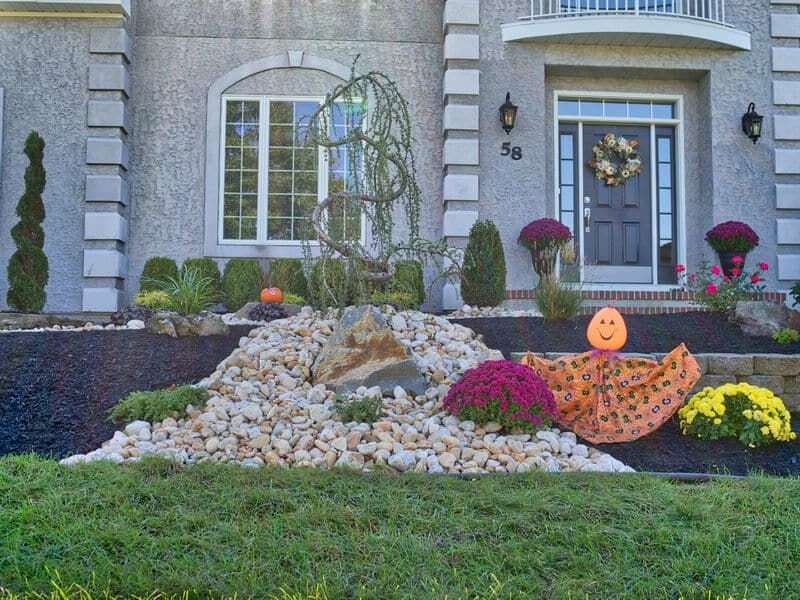 A full redesign of their current landscaping in the front of the house. Part of the remodel included an update their back yard and pool area. 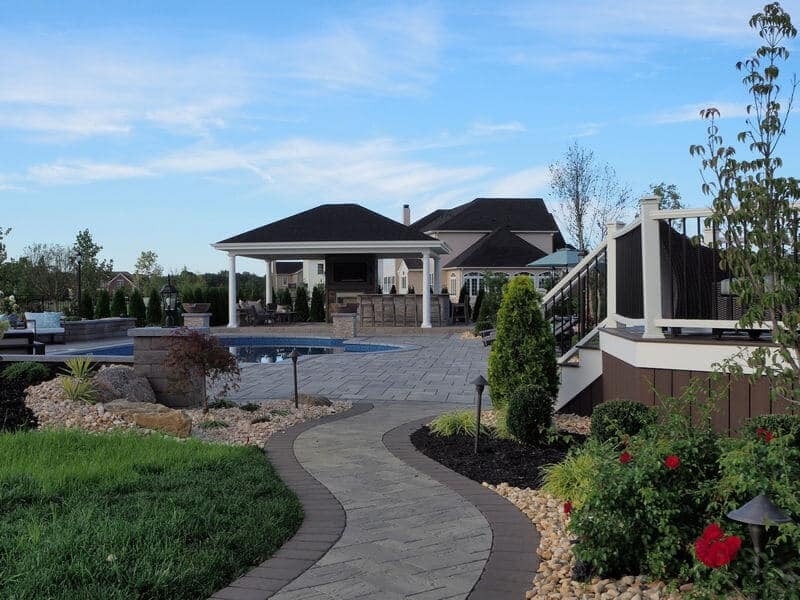 To bring the design together we tied the patio, pool deck and their new pavilion area with multiple walkways and stepping stone paths. 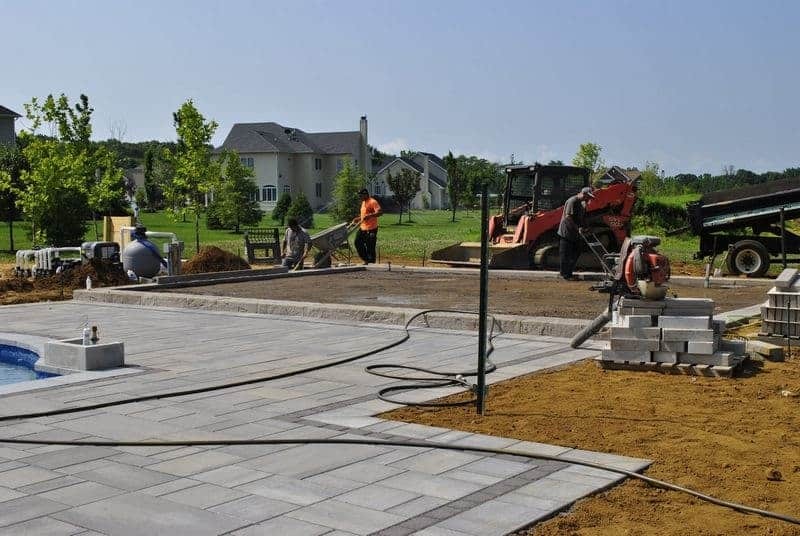 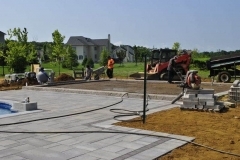 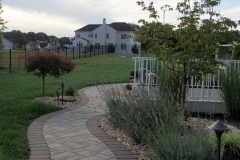 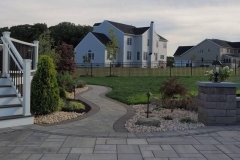 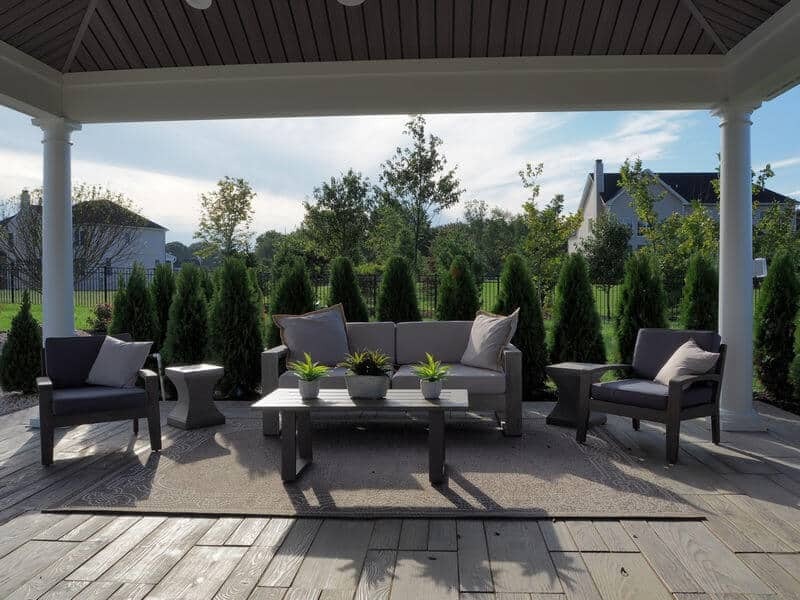 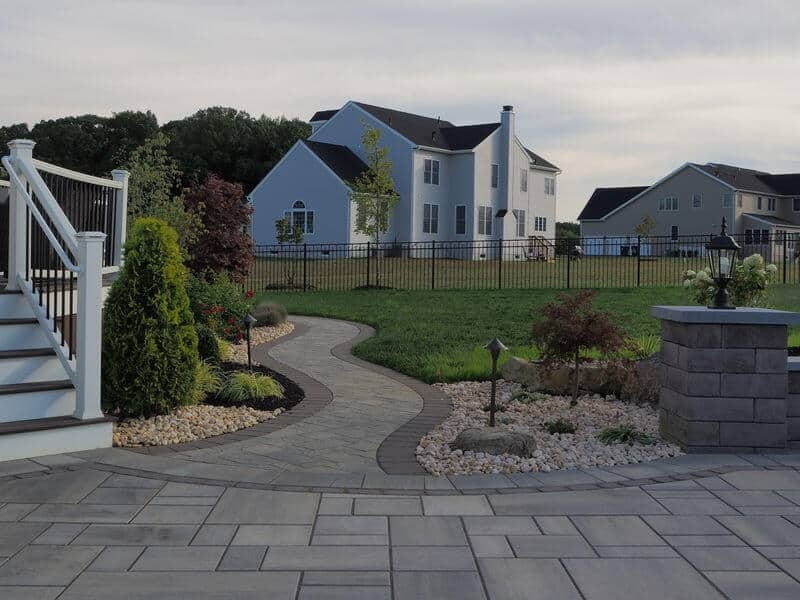 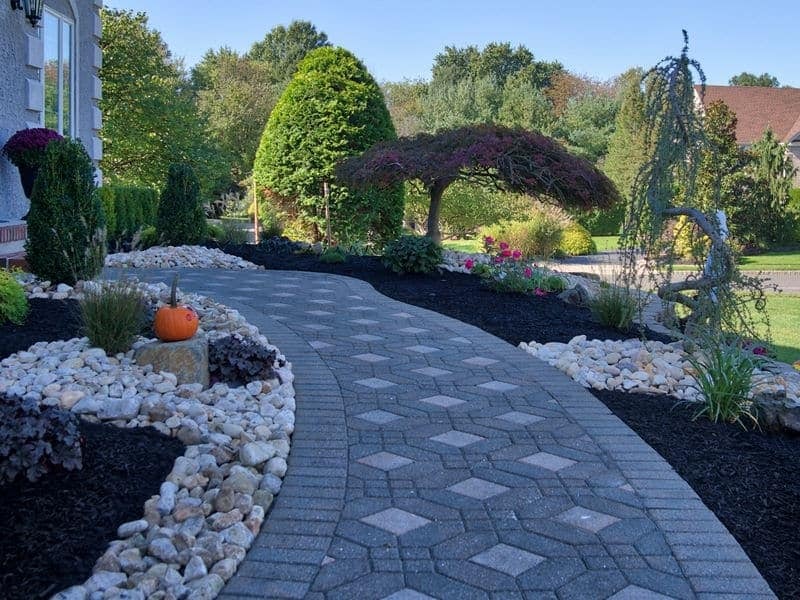 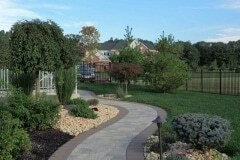 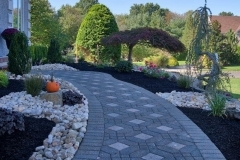 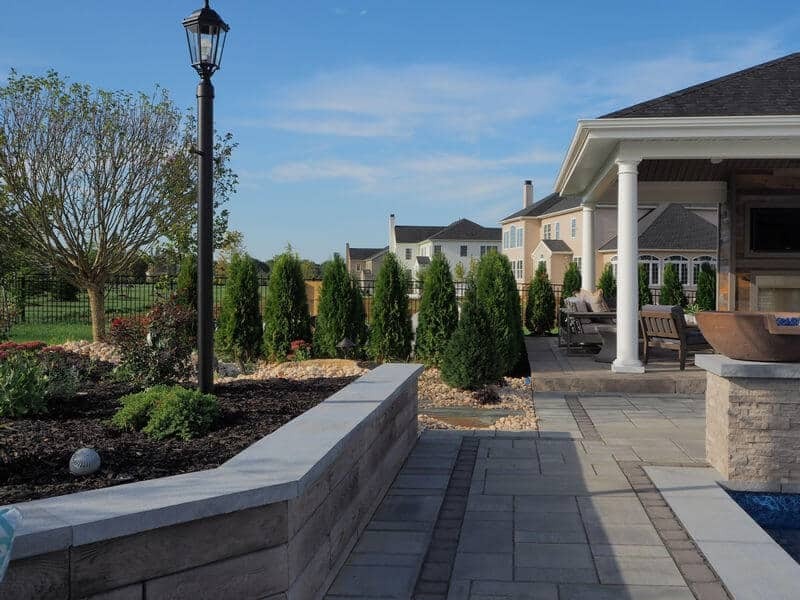 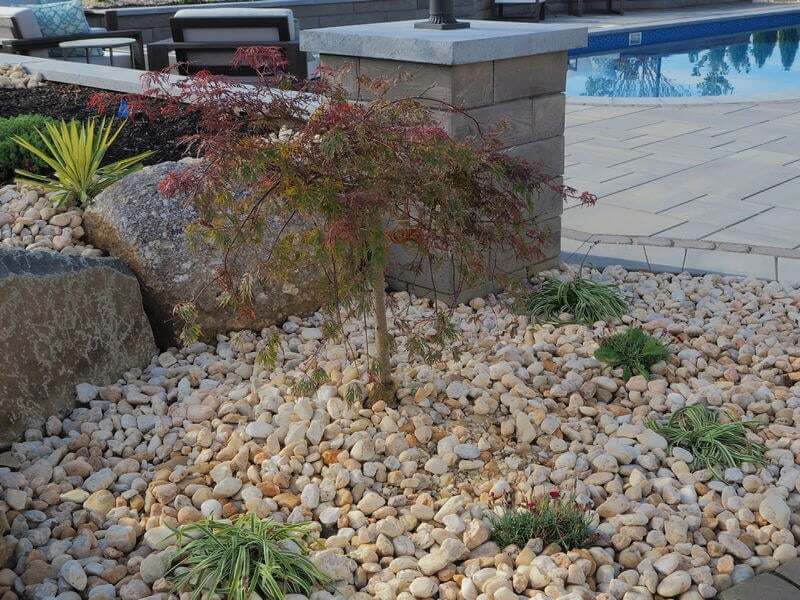 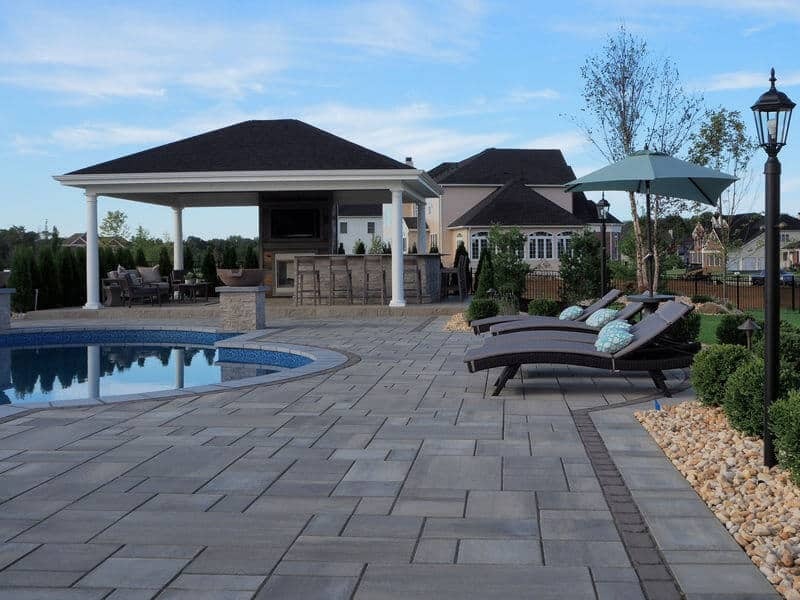 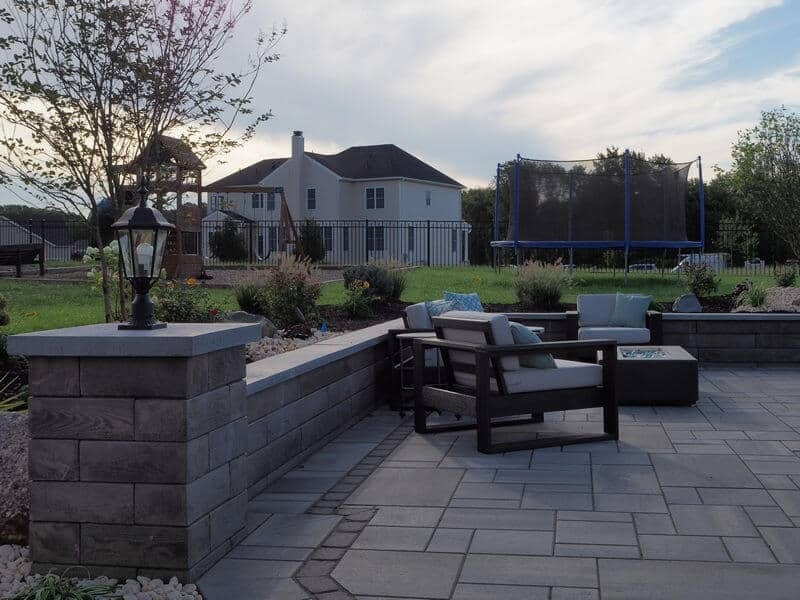 All new hardscape design elements feature concrete pavers and blocks from Techo-Bloc. 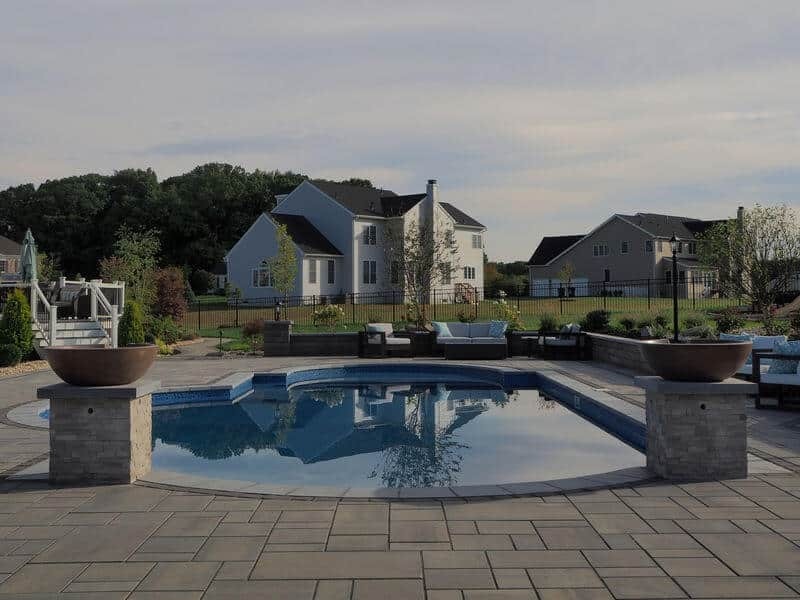 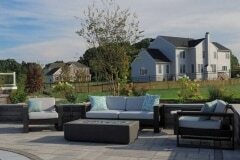 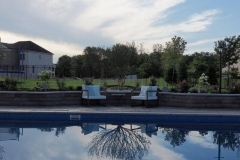 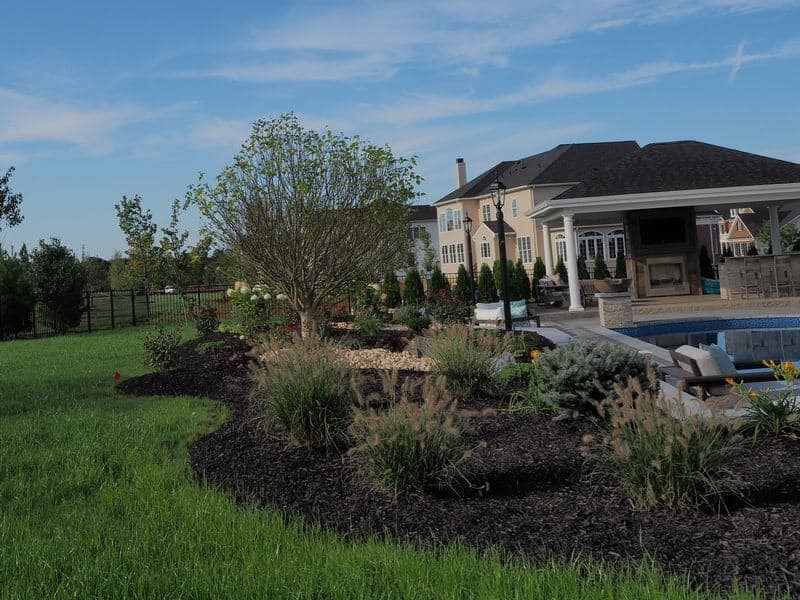 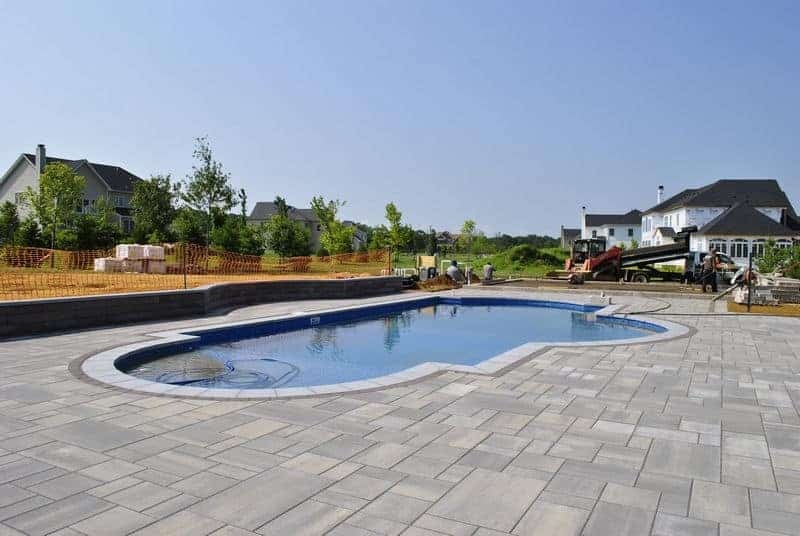 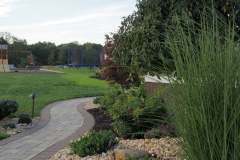 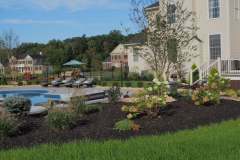 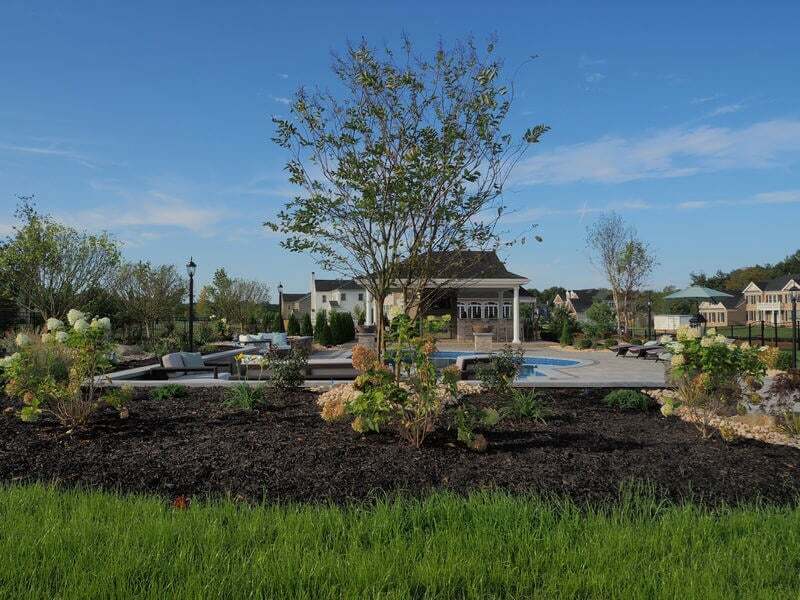 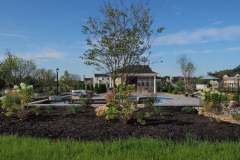 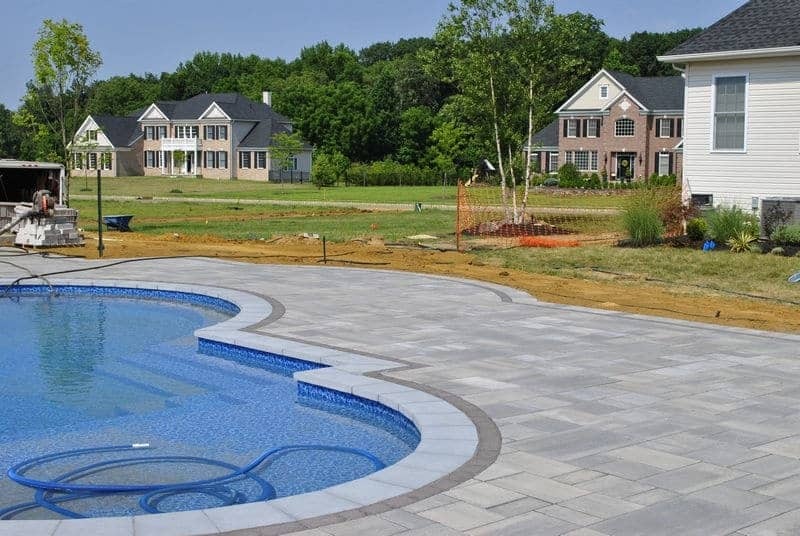 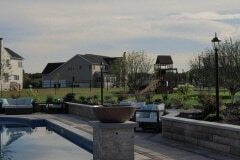 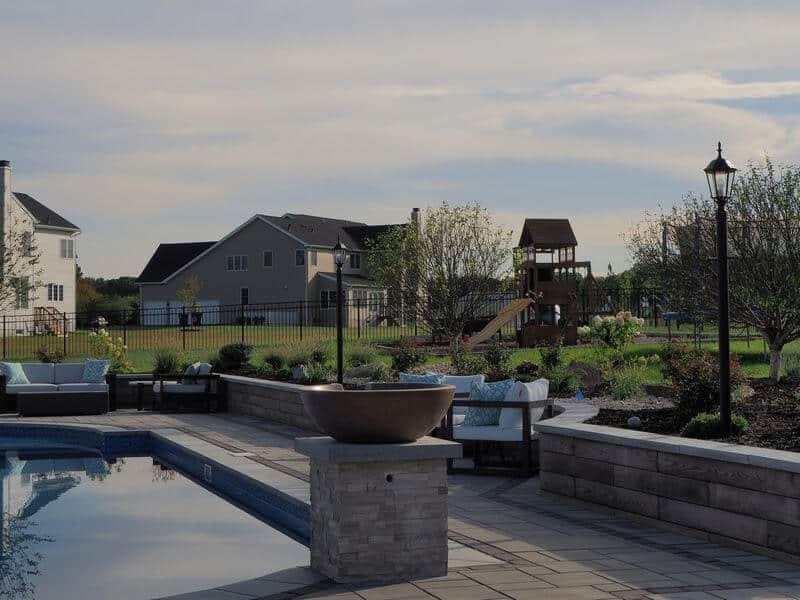 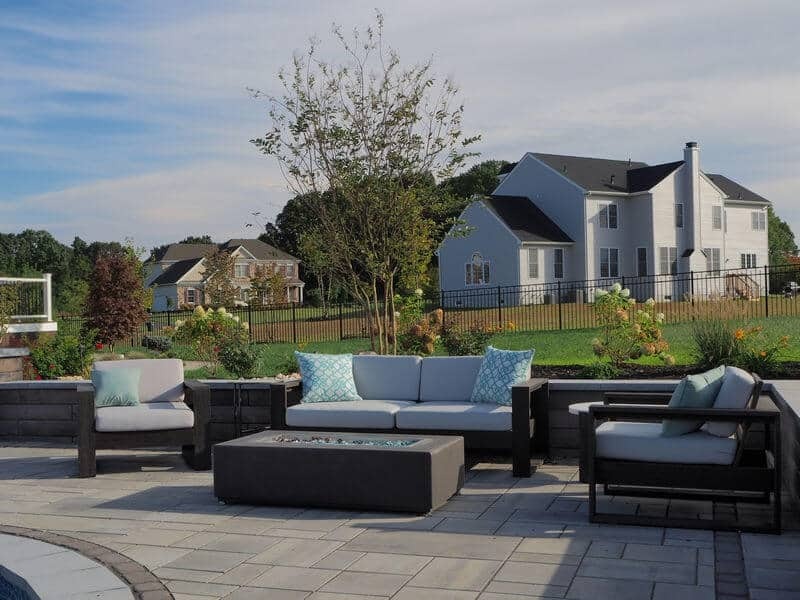 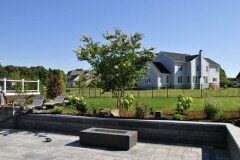 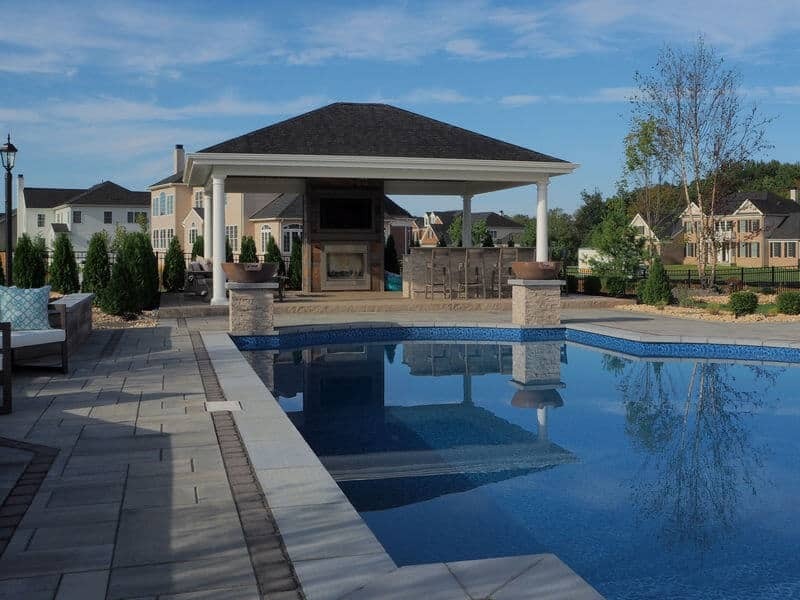 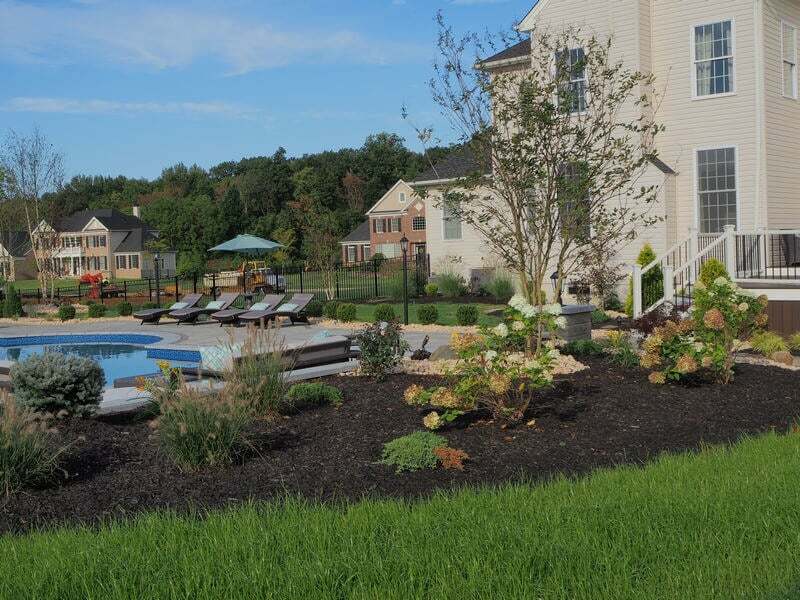 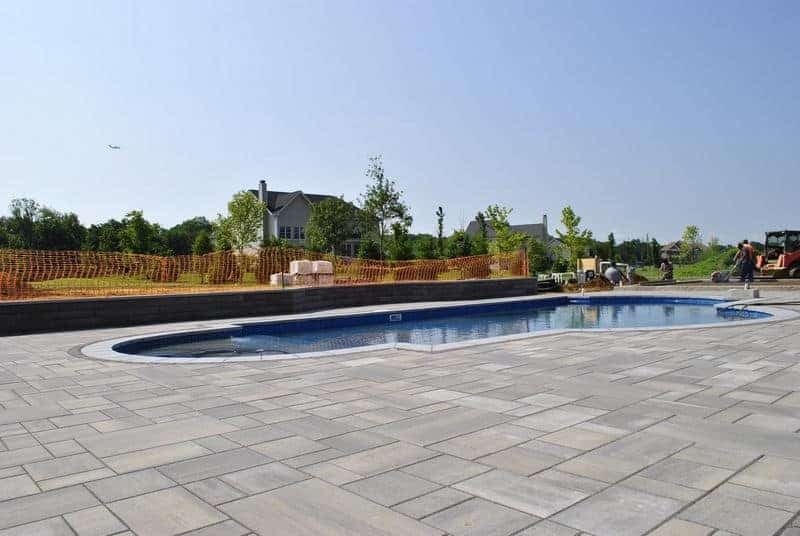 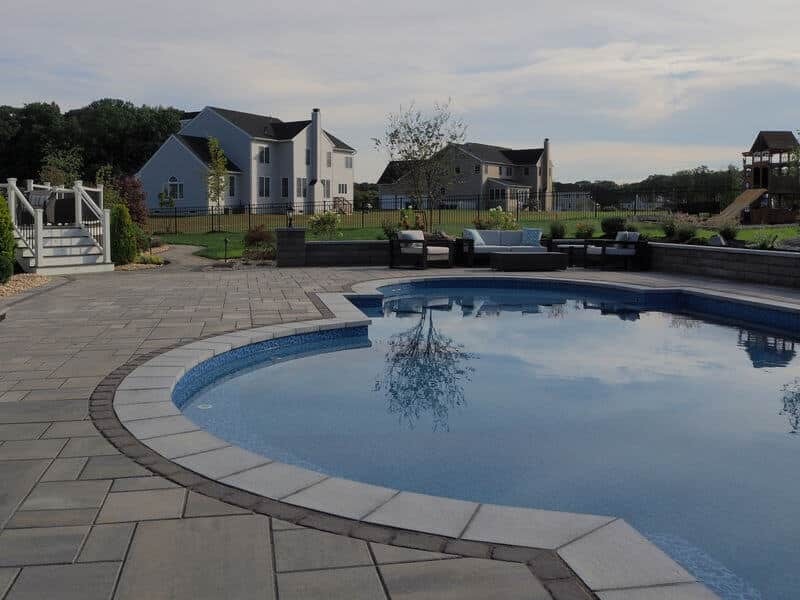 We recently completed an entire landscaping, patio, and pool deck design for a client in Marlboro, NJ. 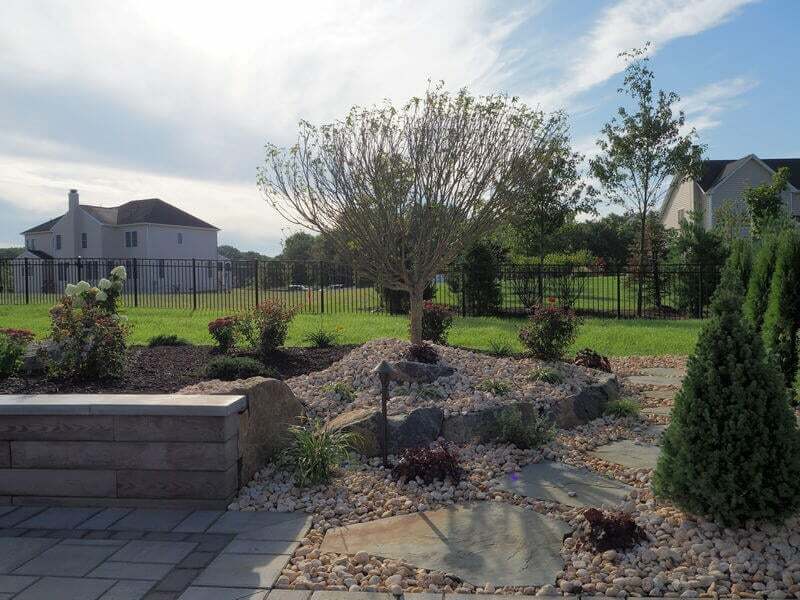 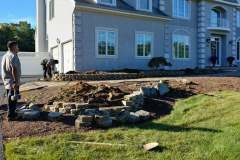 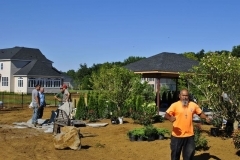 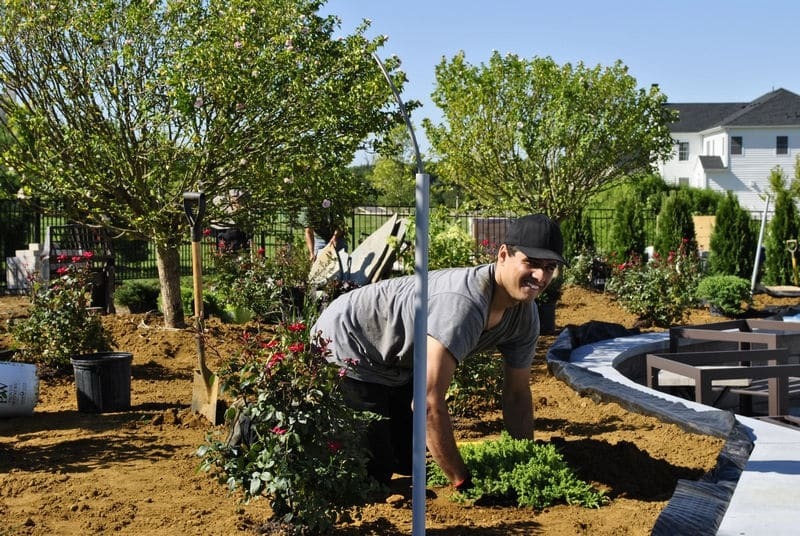 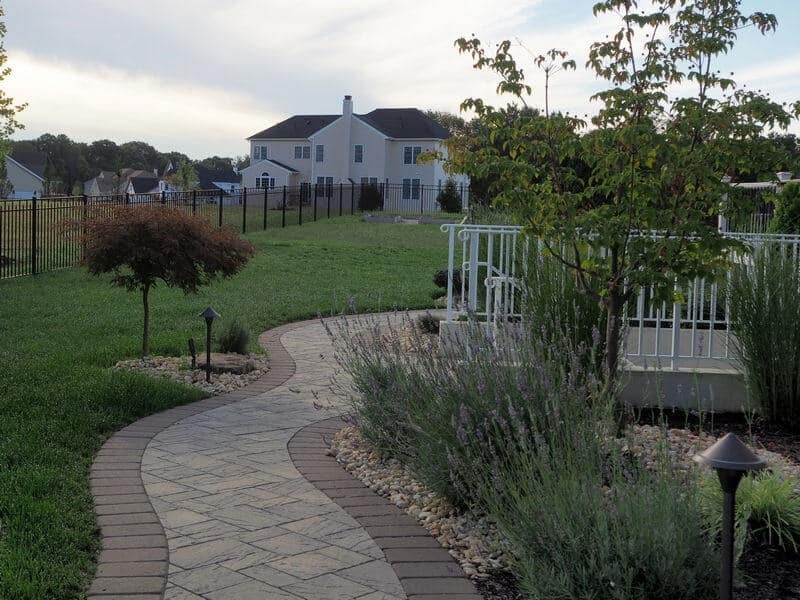 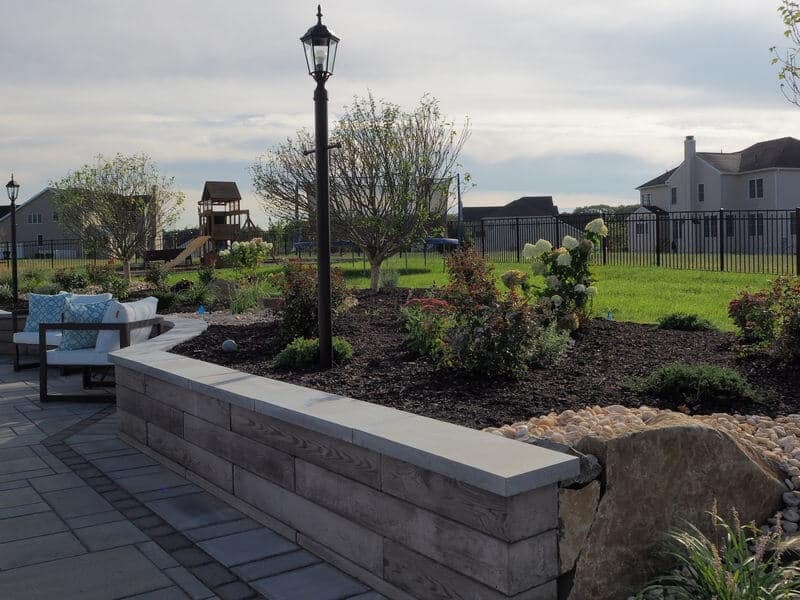 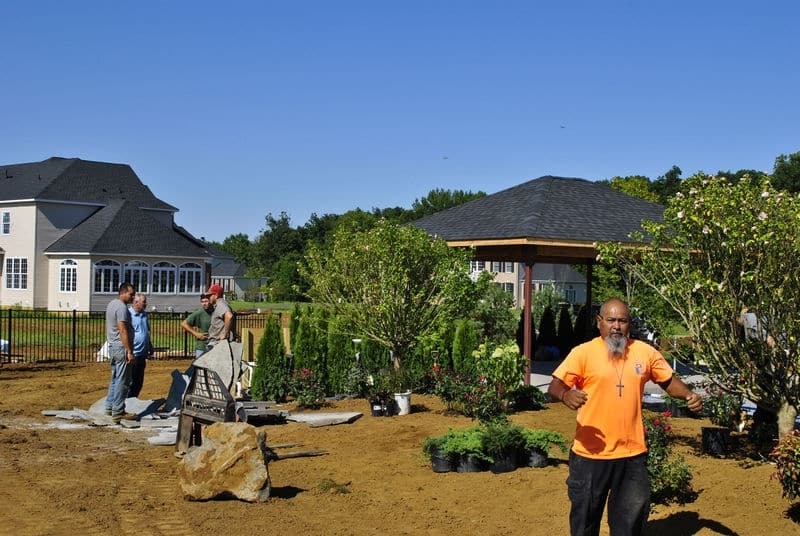 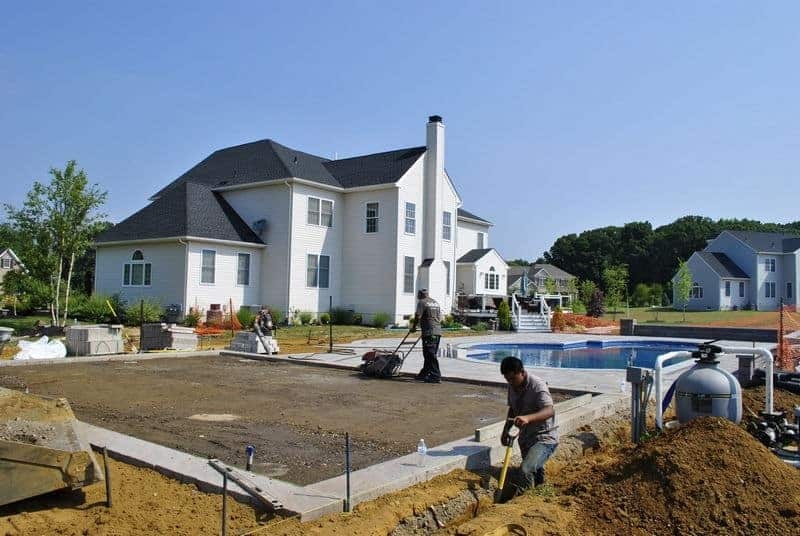 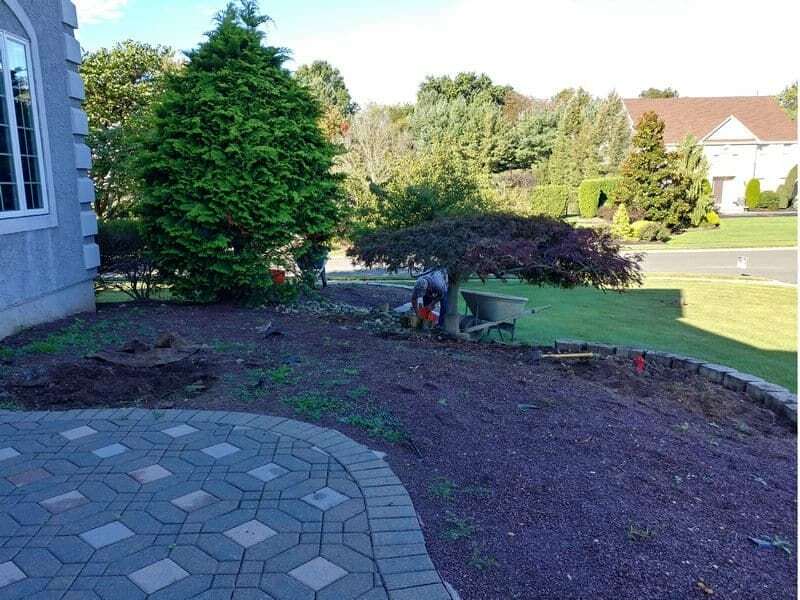 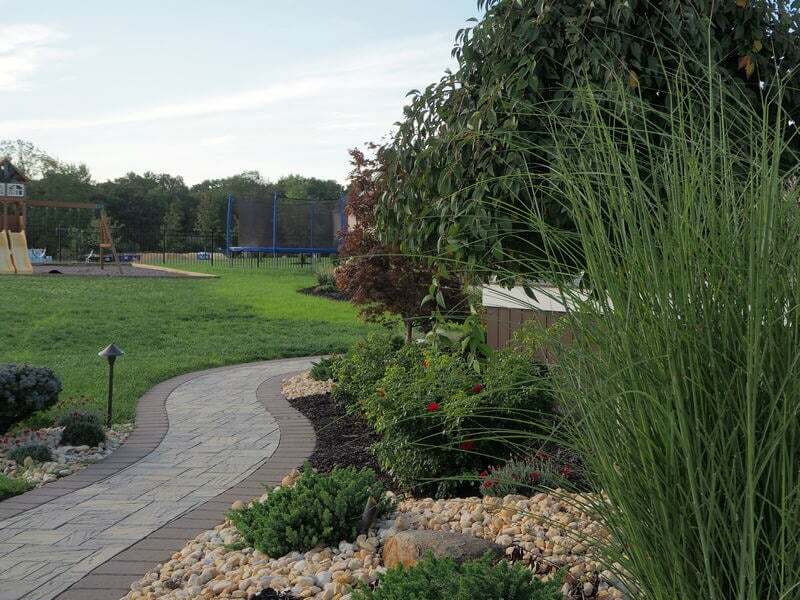 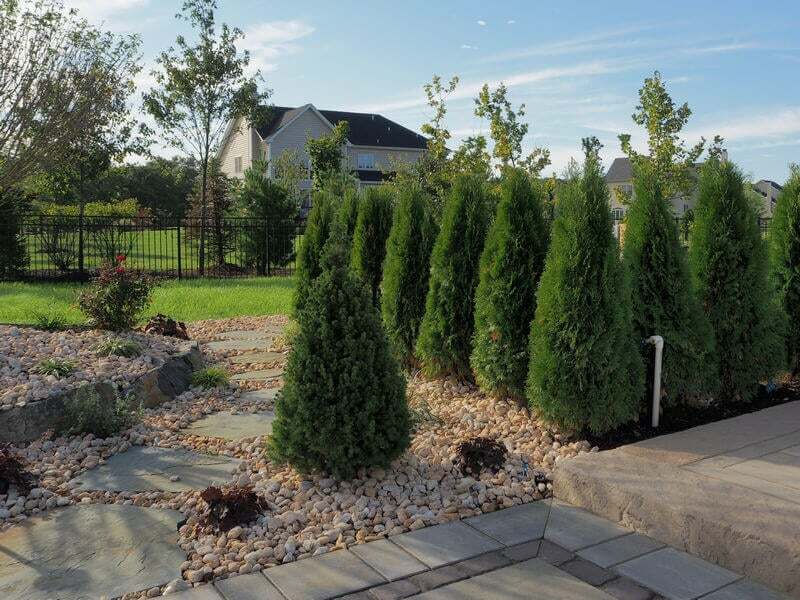 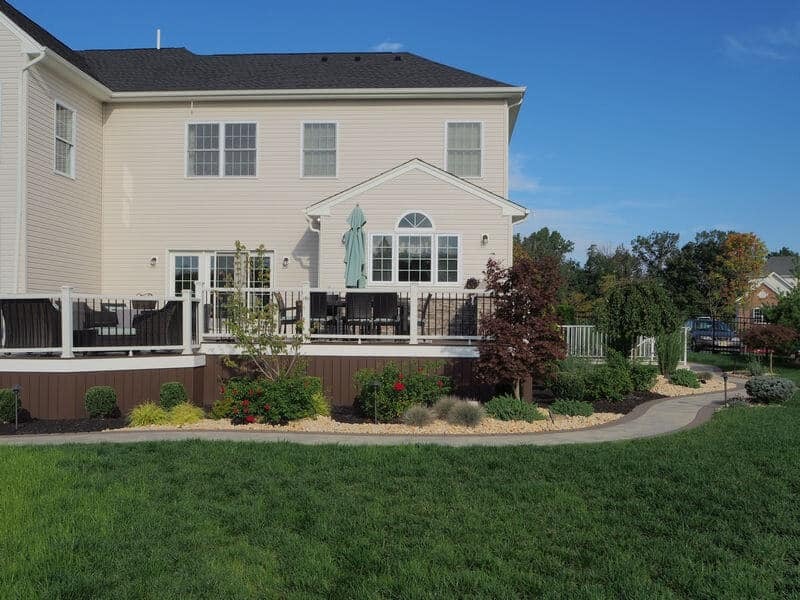 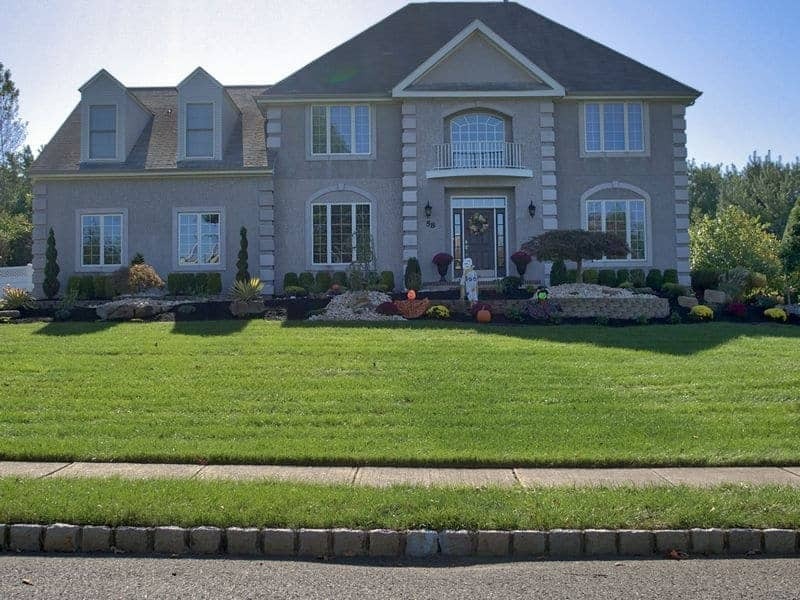 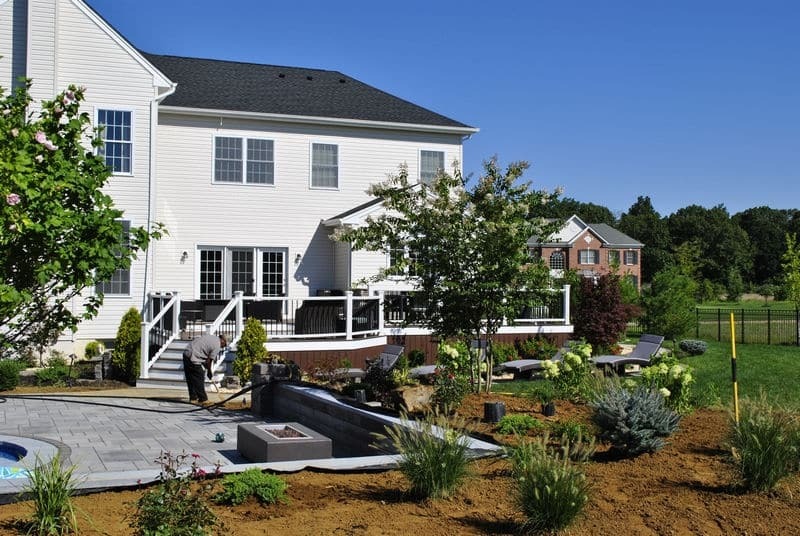 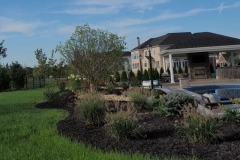 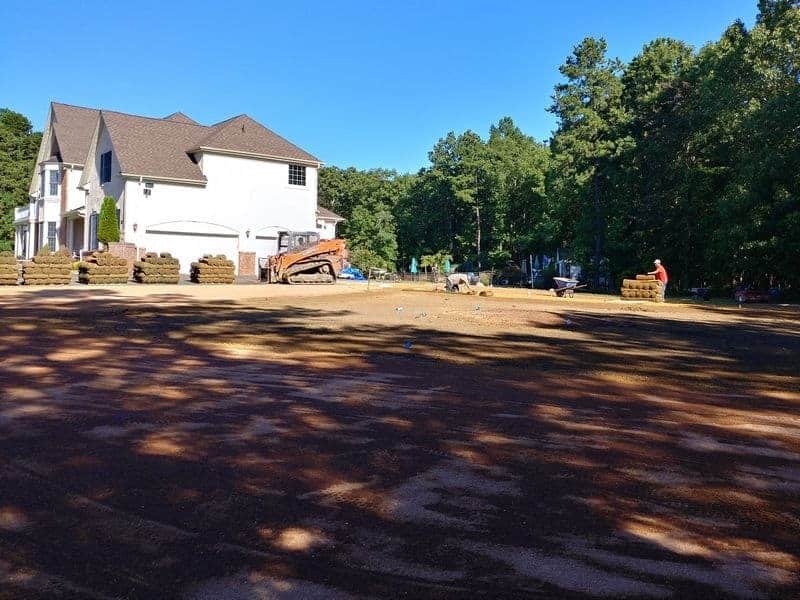 Our clients wanted an entire make over of their backyard in Marlboro, NJ. 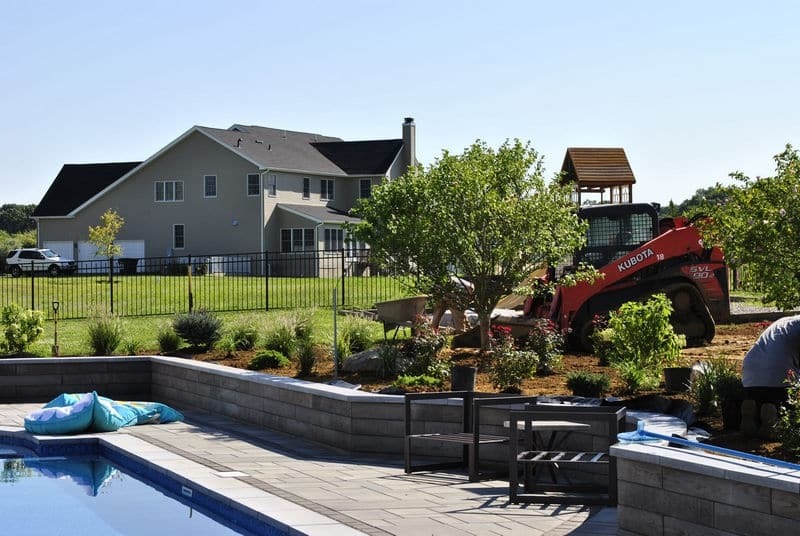 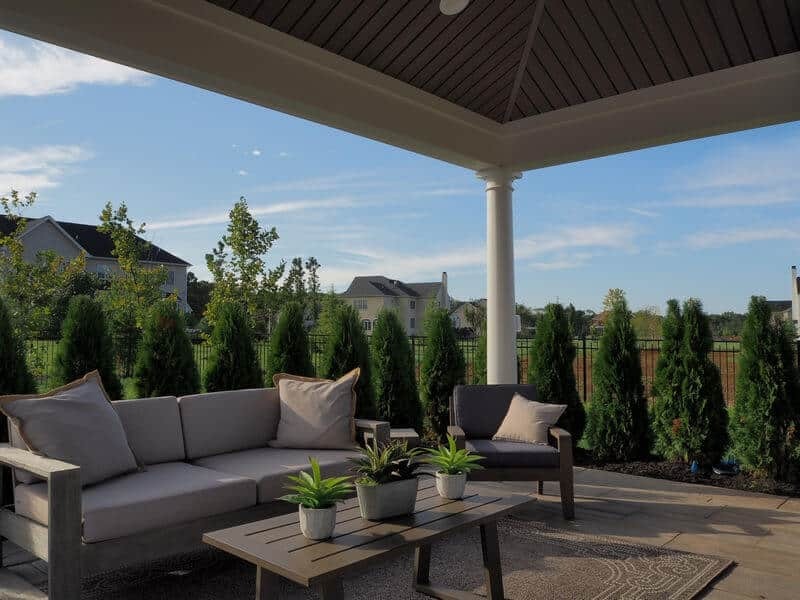 Our designers put together a complete landscape design for the backyard including a new patio, steps, pool deck, and pool coping. 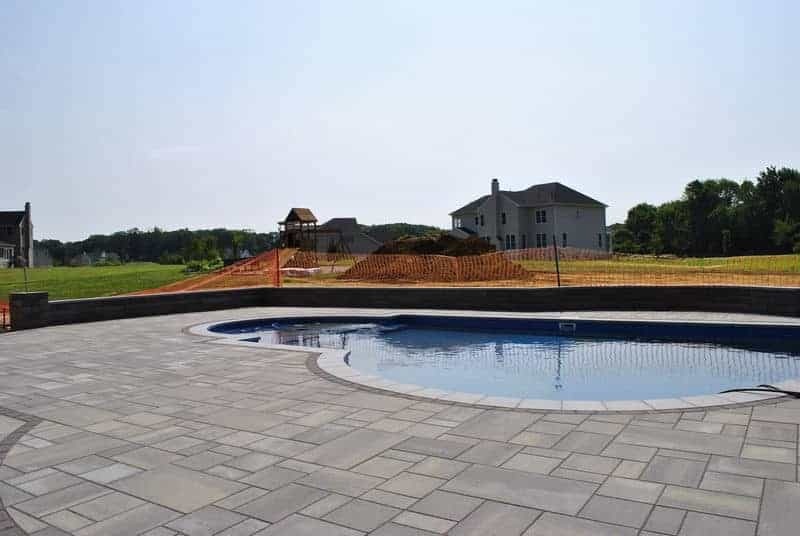 Pool Coping & Deck in Manalapan Completed! 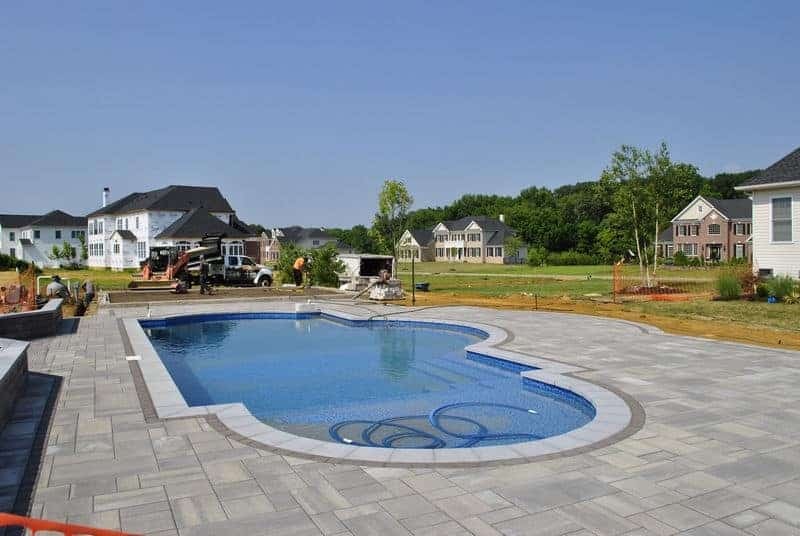 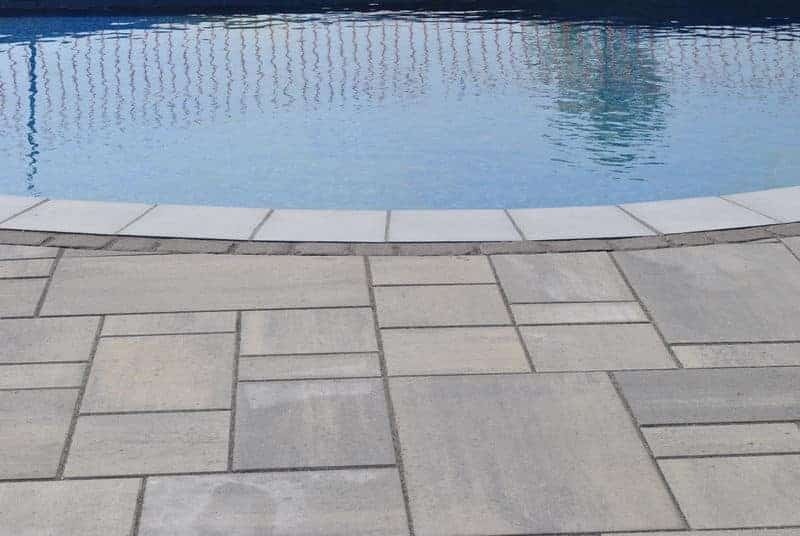 Last week we finished up our customers new pool deck and pool coping in Manalapan, NJ. 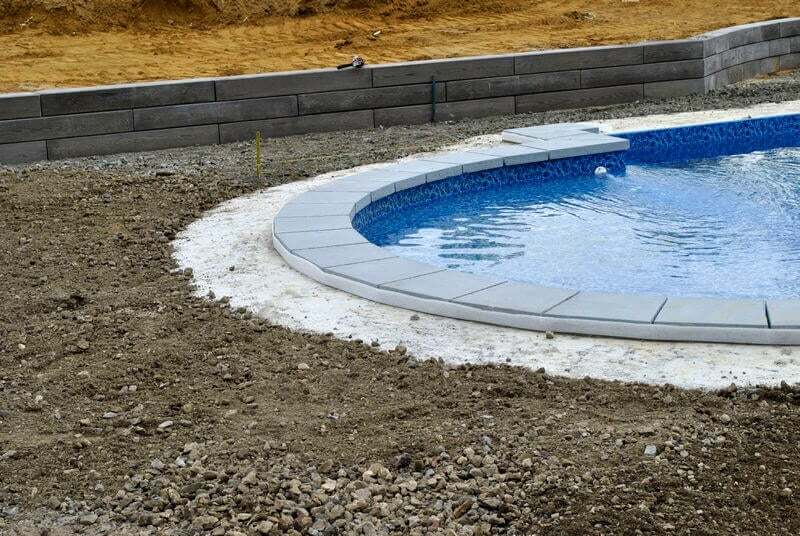 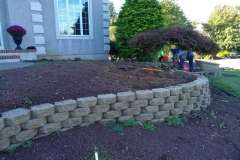 Along with the pool deck and pool coping we installed a sitting wall by the pool. 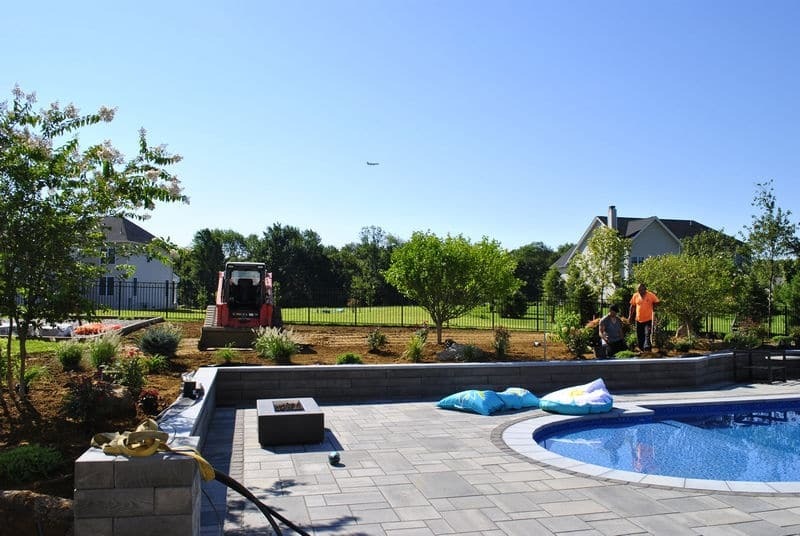 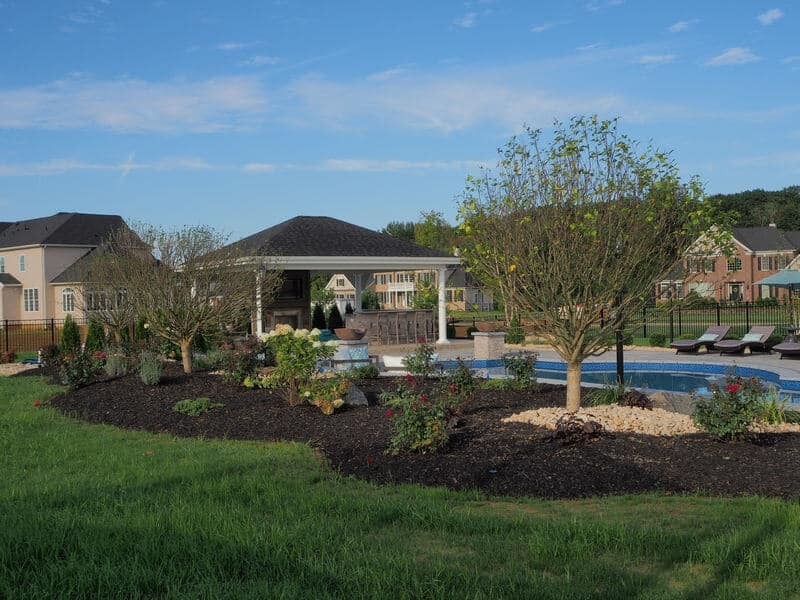 The landscaping around the pool was designed to tie in the new pool area with the look and feel of the rest of the outdoor living space. 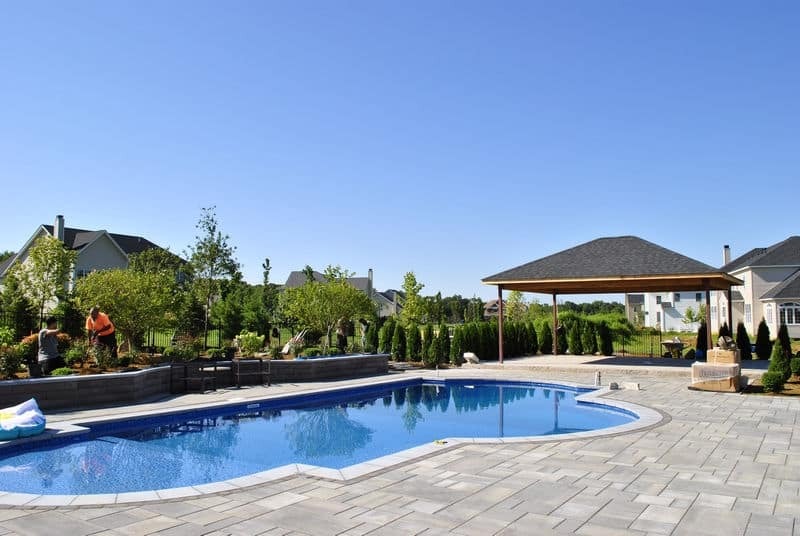 The new pool deck and coping transformed the pool into an extension of the outdoor living space. 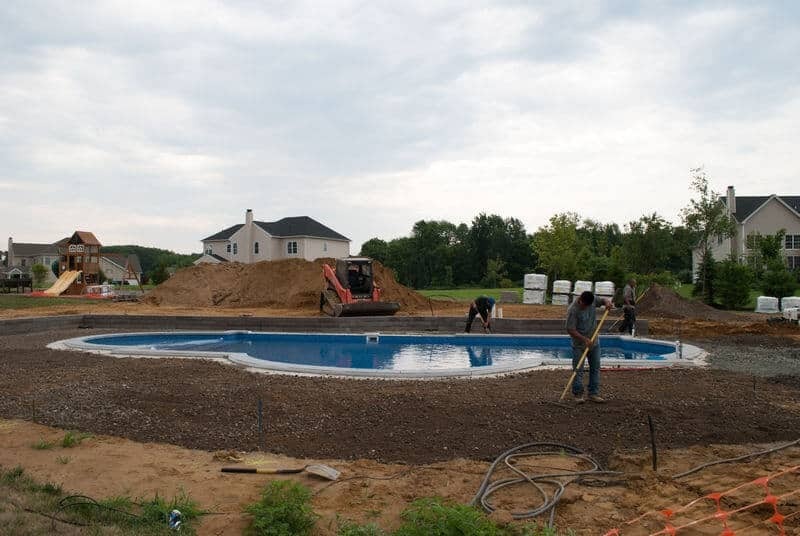 cleaning up and reinstalling the pool coping.